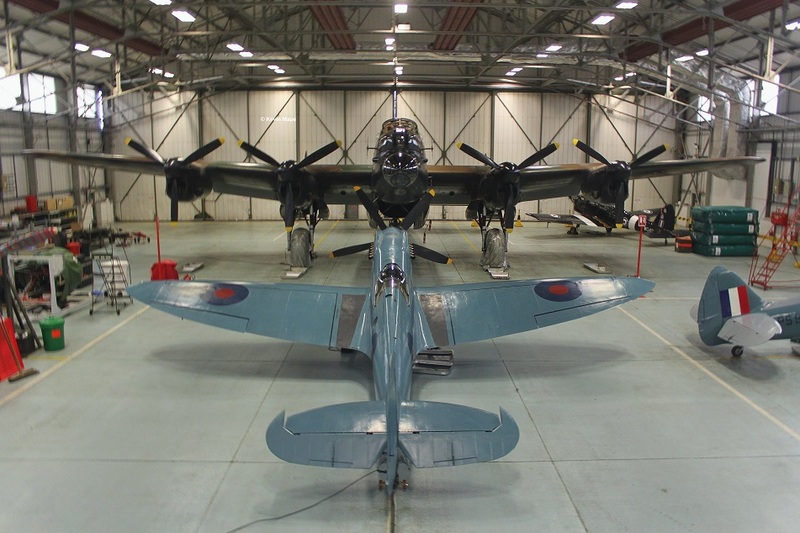 BBMF – Aircraft Histories – Current aircraft. – Updated 29th January 2019. 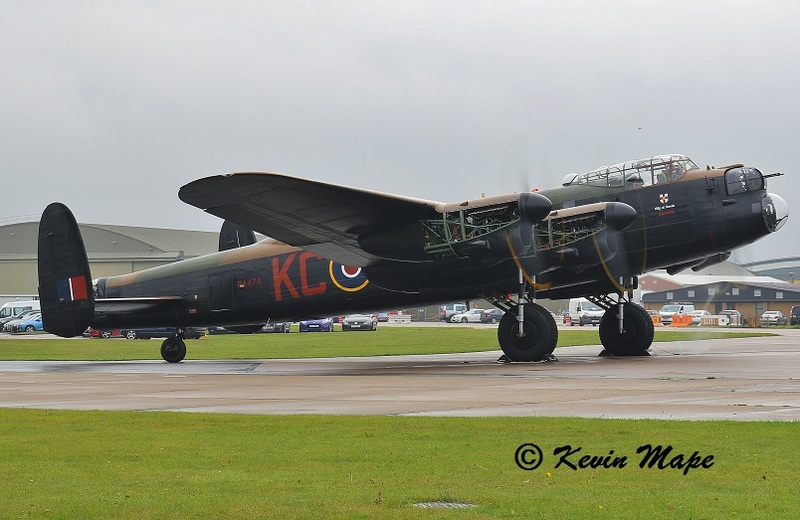 PA474 – Taken at RAF Coningsby 25th April 2011. Mid 1957 the Biggin Hill station commander Wg Cdr Peter Thompson DFC had one of the last Hawker Hurricanes left in the RAF based with the station flight, he asked if he could keep the Hawker Hurricane IIc LF363 to form a flight so the right aircraft types used in the Battle of Britain could be represented in flypasts and displays, Permission was granted but the servicing had to be done on a voluntary basis at no cost. the unit was to be called the Memorial Flight. Over the years the flight has had it’s up’s and downs with the Spitfire LF XVIe’s proving to be problematic they were retired, TE330 was presented to the USAF Academy in exchange for a P-51D Mustang , The second TE476 went to the gate at RAF West Raynham and the third SL574 was sent to guard the gate at RAF Bentley Priory. 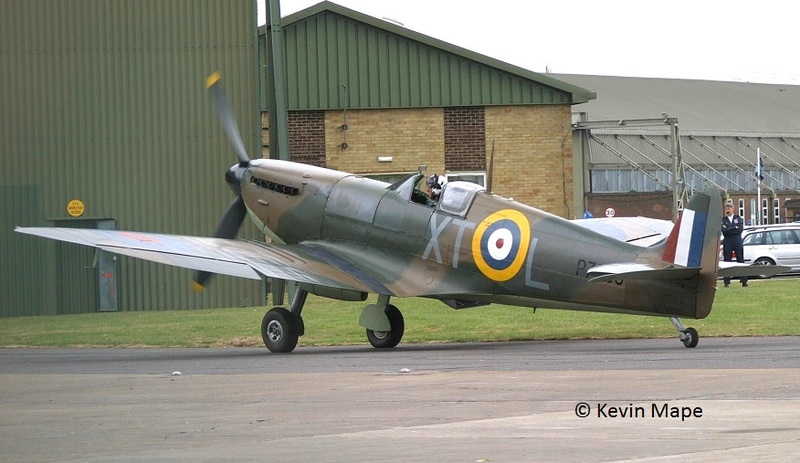 This left the flight at this time with just two aircraft Spitfire PR XIX PM631 and the Hurricane IIc LF363. 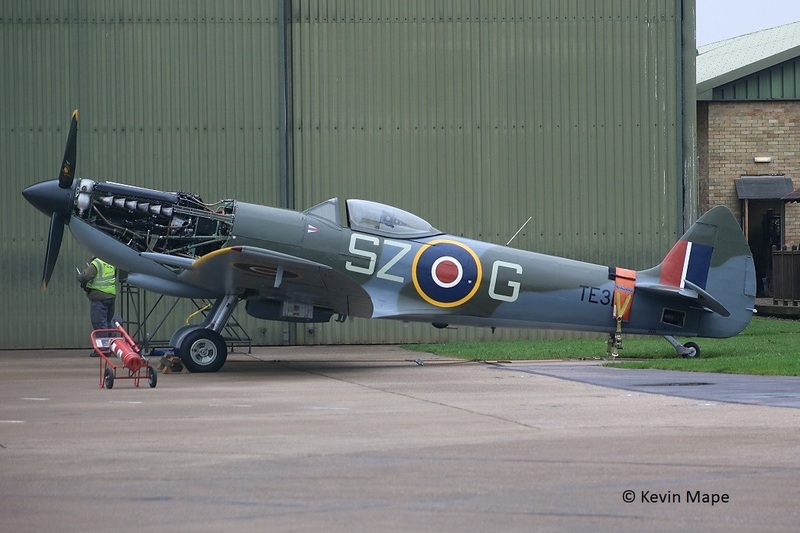 April 1964 Spitfire PR XIXe PS853 re -joined after being returned to flight. 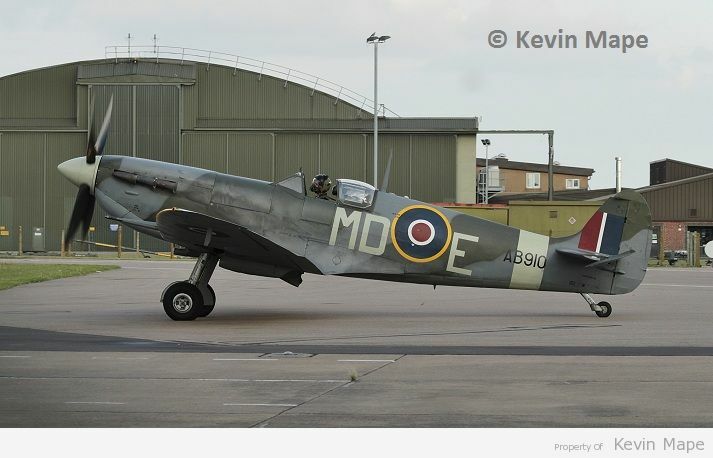 1965 Spitfire Vc AB910 which was donated by Vickers Armstrong. September 1968 following the end of filming the movie “Battle of Britain ” in 1968 Spitfire IIa P7350 was donated to the flight, This Spitfire flew in the real battle of Britain. March 1969 the flight was renamed as Battle of Britain Memorial Flight. 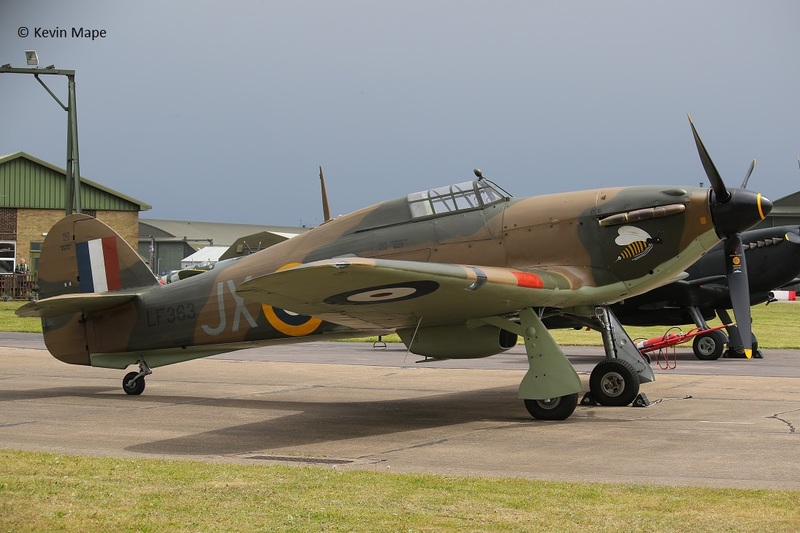 29th March 1972 marked the arrival of Hurricane IIc PZ865 the last Hurricane built,this was donated by Hawker’s. 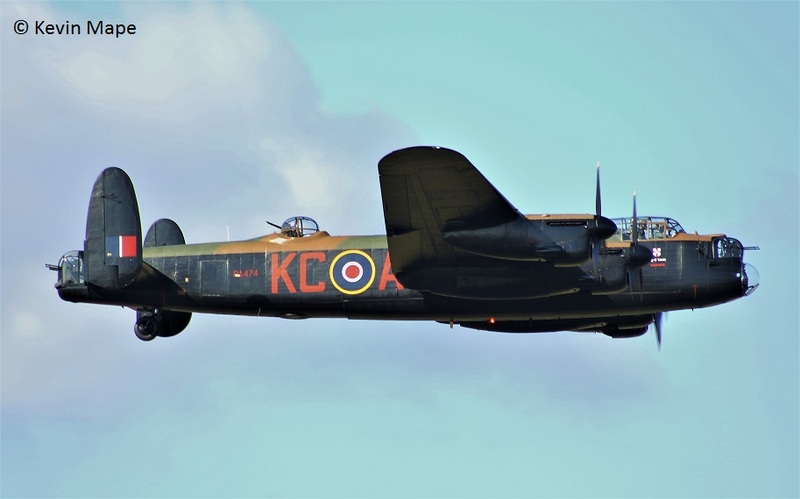 November 1973 Lancaster BI PA474 was added after being flown by 44Sqn at Waddington with the aircraft being coded KM-B. 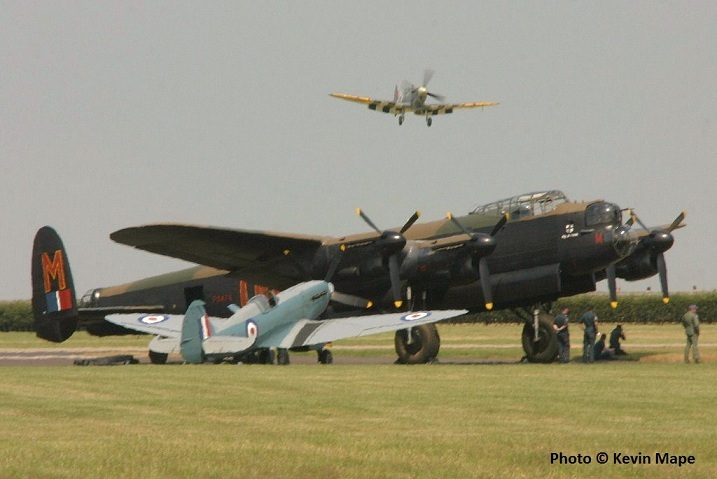 1976 – BBMF moved to RAF Coningsby the flight established themselves for life in South Lincs. April 1985 The unit aquired DH104 Devon C2 VP981 in the April of 1985 as a support aircraft to operate when aircraft were operated away from Coningsby. April 1987 Spitfire PR XIXe PS915 re-joined the fold after being returned to airworthy status by BAe at Salmesbury. April 1993 a Douglas Dakota III was transferred from Boscombe Down to replace the DH104 Devon which was later sold. 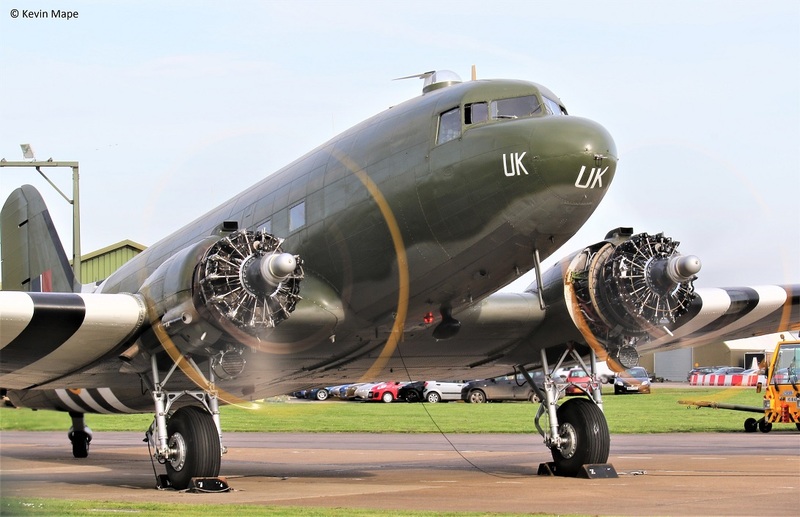 The Dakota was sent to Air Atlanique’s base at Coventry and had it’s “Raspberry Ripple” paint scheme replaced with WW II marks and coded YS-DM/248Sqn. 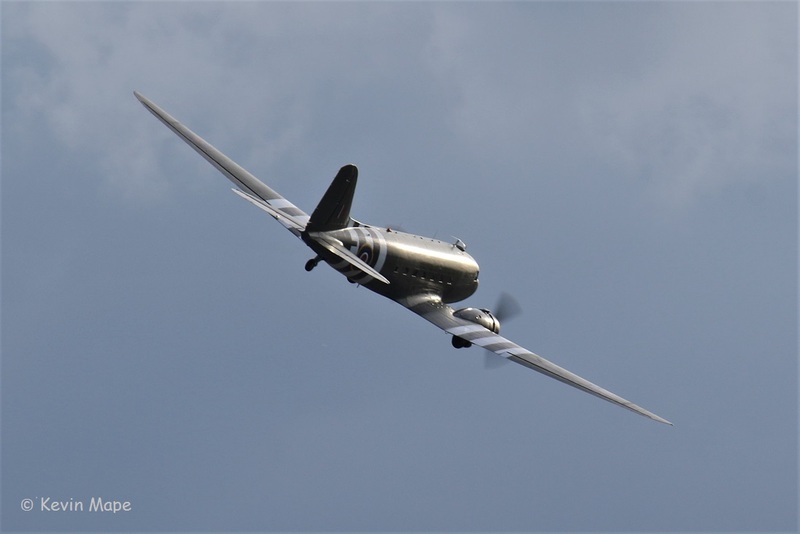 The Dakota is used to train the Lancaster Crew and is also used to display at many airshows, The Dakota is also used for para dropping and support of the flight, the codes were changed to YS-H then ‘AI ‘/267Sqn marks. 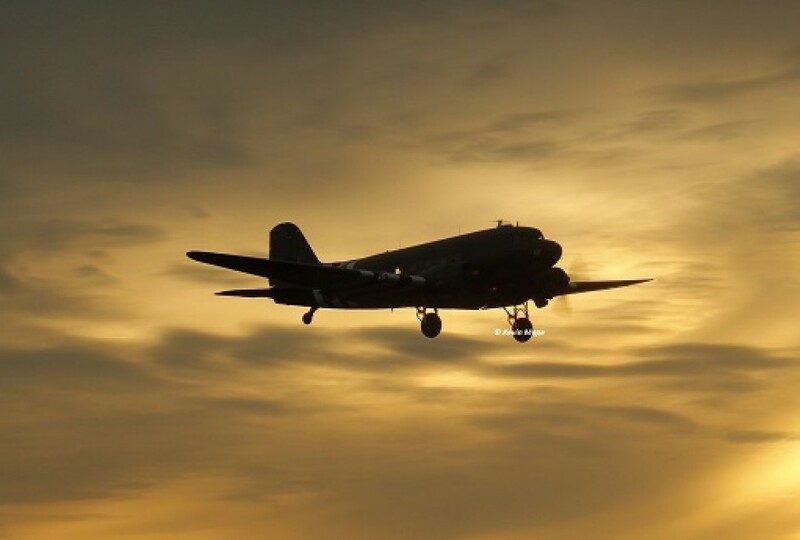 The currant Sqn marks on the Dakota are of UK/233Sqn. 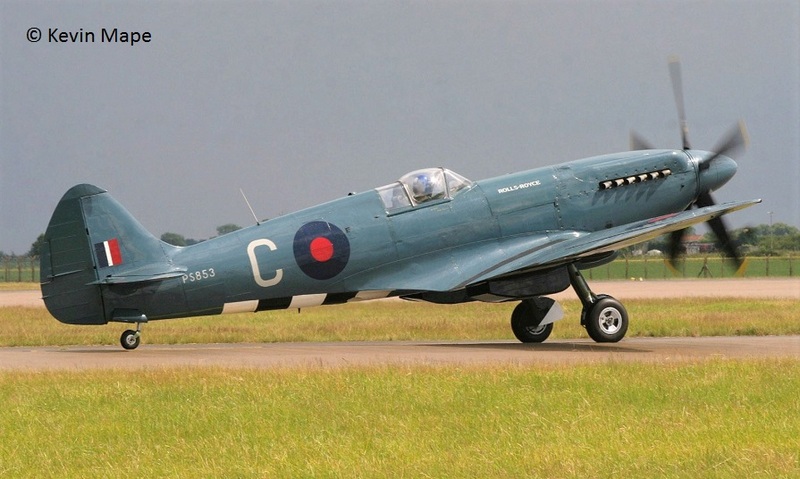 17th February 1995 – Spitfire PR XIX PS853 was sold to Euan English at North Weald to raise the funds needed to rebuild the Hurricane IIc LF363. 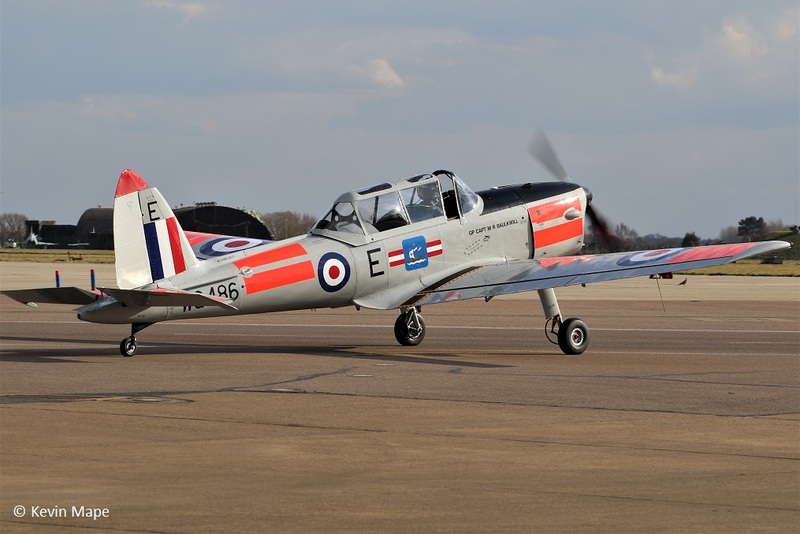 1995 Chipmunk T10 WG486 arrived in an all white scheme from service with RAF Germany, this replaced WP855 . 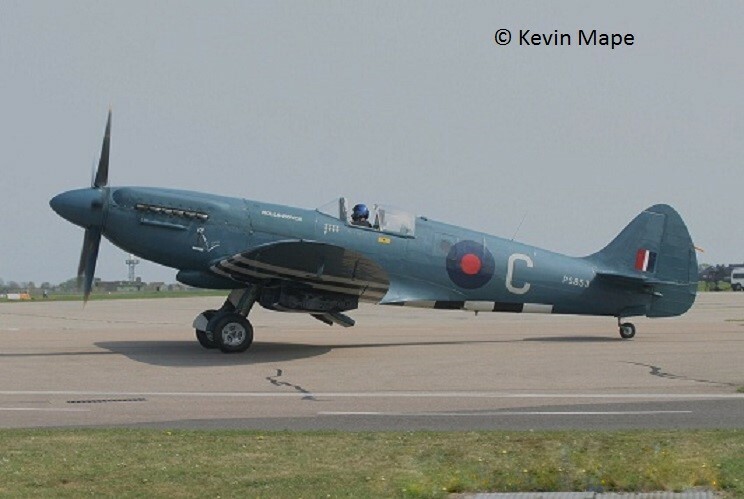 1997 saw the arrival of another Spitfire this time a clipped winged LF IXe MK356 a WWII veteran with a good pedigree. this wore it’s 441(Hornet)Sqn RCAF marks that it wore when based at RAF Digby in April 1944. 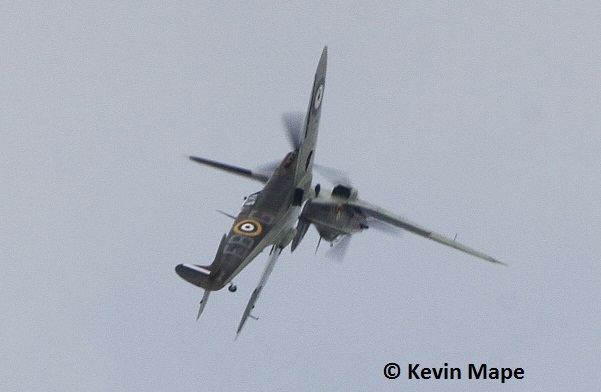 This was fitted with the clipped wings from Spitfire SL674. 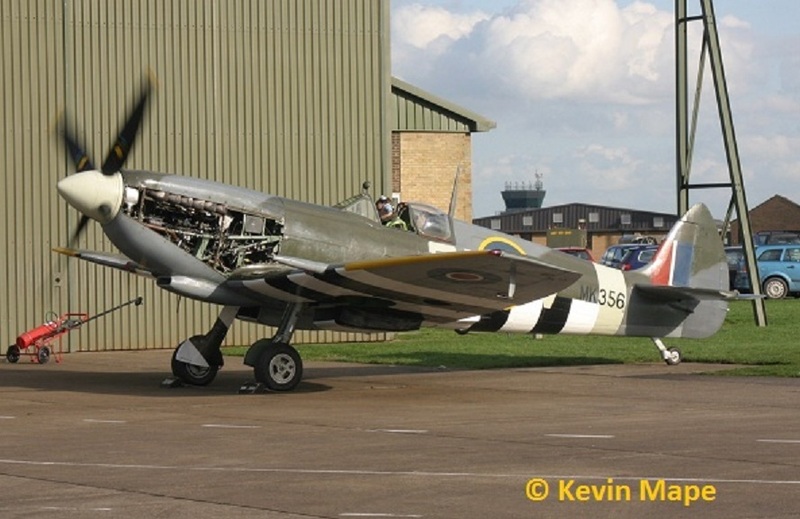 October 2001 marked the arrival of two Spitfires XIV’s TE311 and TB382 for reduction to spare parts, Only TB382 became spare parts while TE311 has spent eleven years being rebuilt before it’s first flight , This is the same Mk LF XVIe type of Spitfire that flew in the early days of the BBMF at Biggen Hill in 1957. 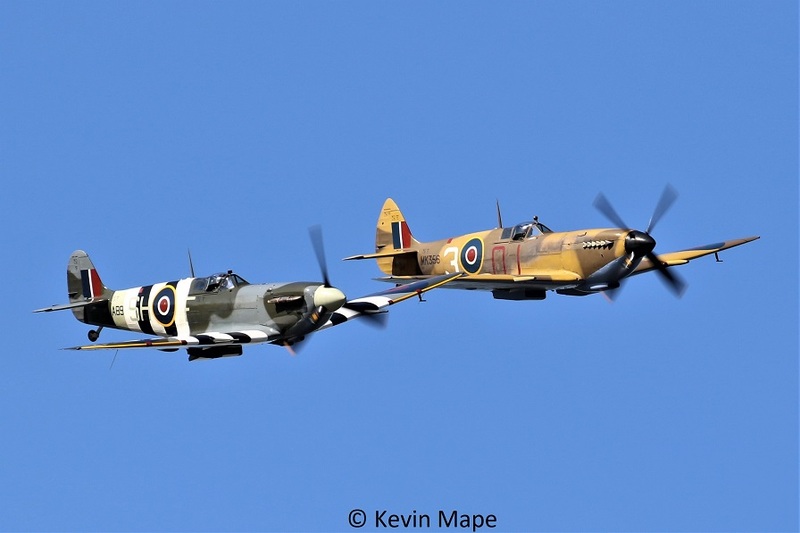 2007 – 50th Anniversary season – the original four aircraft, LF363,PM631,PS853 & PS915 flew again together. 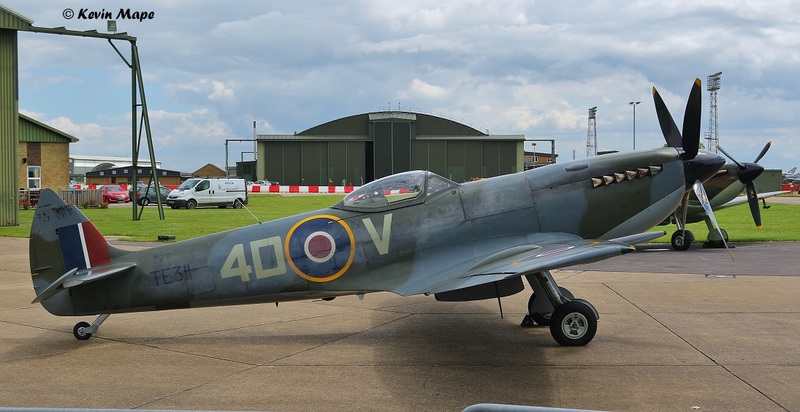 October 2007 MK356 was sent for overhaul to ARC at Duxford, The clipped wings were returned to standard elliptical shape during this time and the Spitfire was painted to represent “MJ250” in the Silver scheme of 601(County of London) when it operated in Italy in 1943 coded UF-Q. 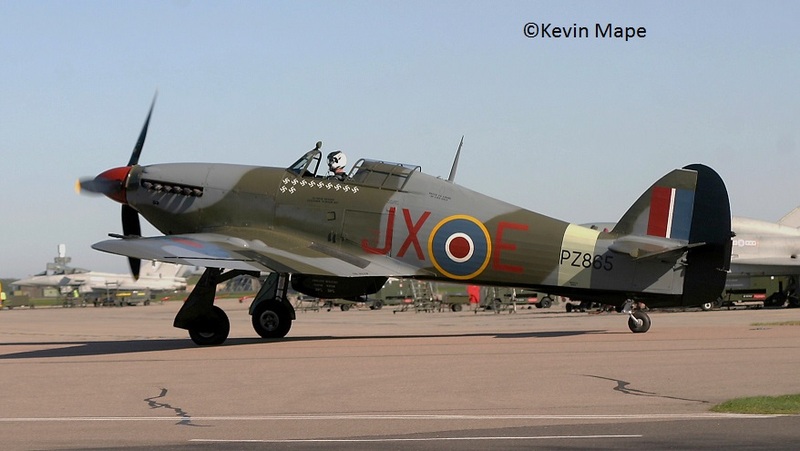 29th October 2012 – TE311 had an eventful first flight after 11 year rebuild when being flown by OC BBMF Sqn Ldr Smith could not get it’s undercarriage down , after a fair few passes it eventually retracted and landed in one piece. 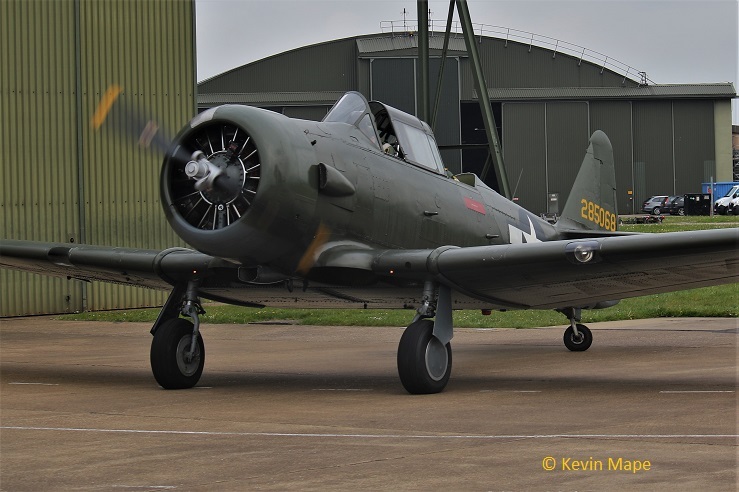 The loan of a T-6 Havard is also used to train pilots just as it did in World War 2. Bases used 1957 – Current. Barkston Heath Based between 2002 – 2004 when RAF Coningsby runway was being rebuilt. 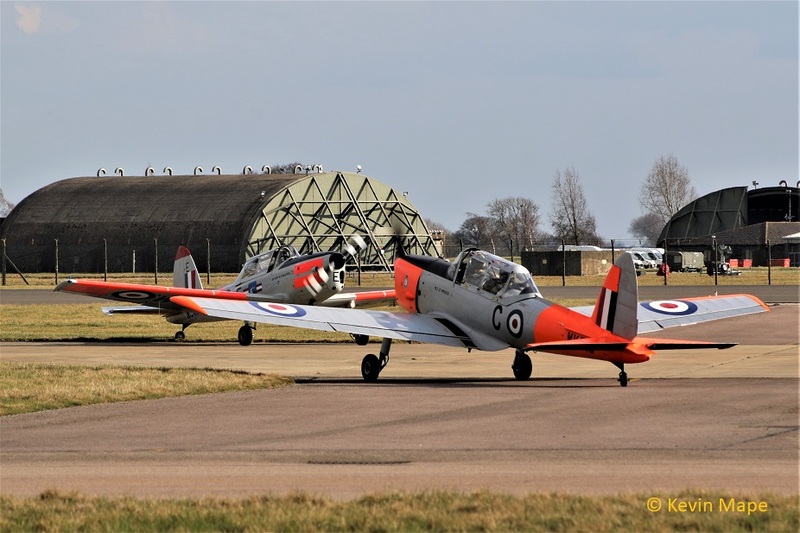 Regular Chipmunk flights using the grass runway as the Admin stayed at Coningsby. RAF Coningsby March 1976 – Current. 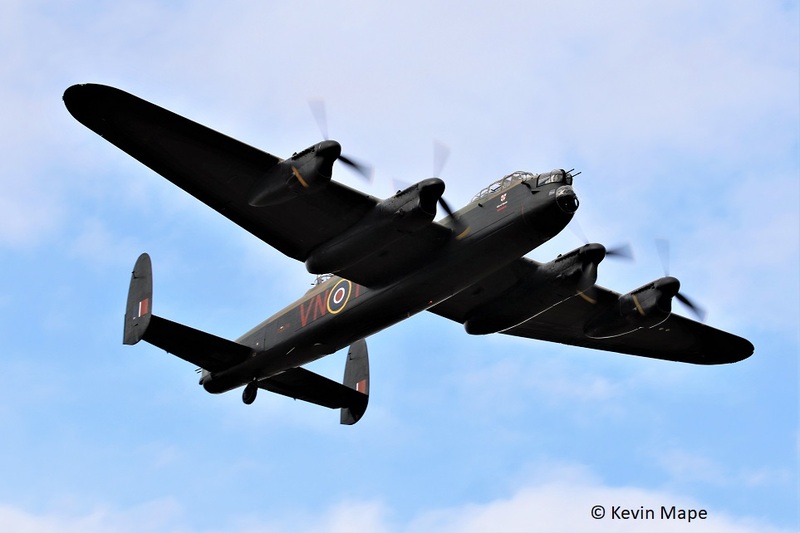 The BBMF for the 2017 season have a very special display with the Lancaster and four Spitfire and the Lancaster with two Spitfire and two Hurricane, First flown on the 10th July it is a fitting tribute to the crews that paid the ultimate price for our freedom. Lest we forget. 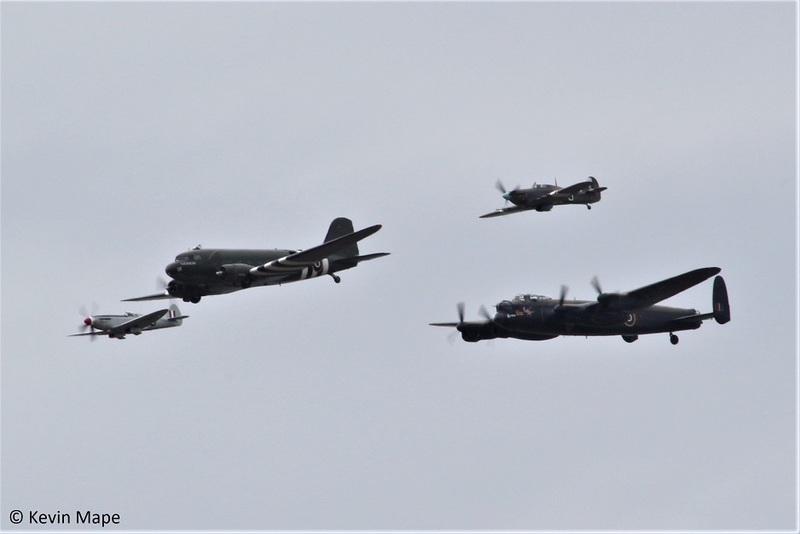 PZ865,TE311,LF363,P7350 & AB910 line up outside on the BBMF ramp. – June 2017. 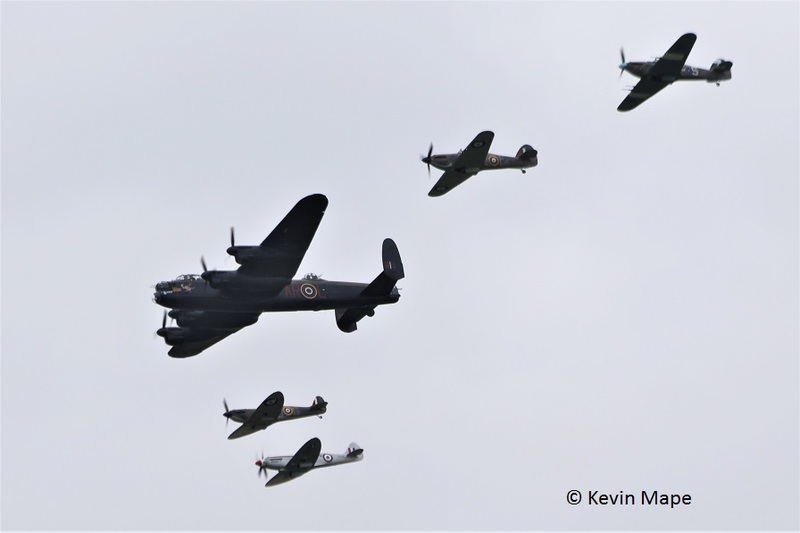 2018 season is the 100 year anniversary of the Royal Air Force, The BBMF have put a new flying program together as the Trenchard formation with the Lancaster, Dakota and as many as five fighters flying in close formation. This display has been a big hit with the public at both RAF Cosford in June and the RIAT at RAF Fairford in July. The end of season brings the Lincolnshire Lancaster Association event at the end of September, this is normally on a Sunday but due to the cancellation of the event due to bad weather it has been moved to Saturday 29th this year, This was the last display for the OC Sqn leader Andy “Milli” Millikin and he chose AB910 to do it. 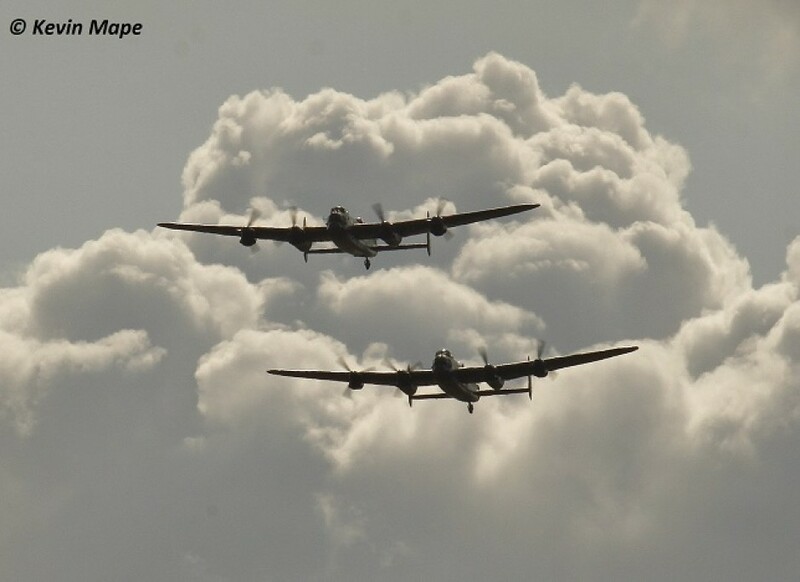 The Lancaster , two Hurricane’s and two Spitfire’s were used in good sunny weather. 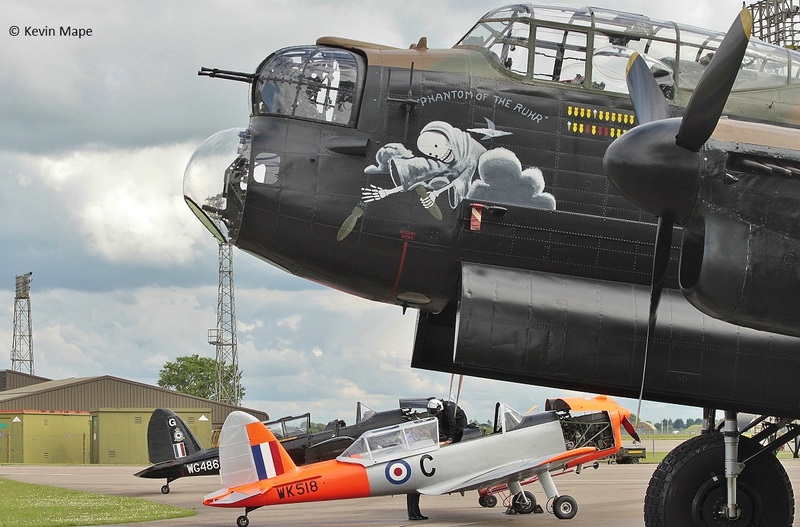 Sqn leader Mark “Disco” Discombe AFC has become the new OC of BBMF. First Flight, January 1, 1944. Delivered to RAF, January 28, 1944– Accepted by 5 MU at RAF Kemble. Allocated to 26 Sqn. Based at RAF Trangmere. – August 1944 – December 1944. August 1947 – Allocated to Fighter Command Communications Sqn Based at RAF Northolt – Wore a silver scheme with red spinner. 6th February 1948 – Allocated to RAF Thorney Island Stn flt . 15th September 1948 – Air Vice Marshall Sir Stanley Vincent DFC AFC led the Queens birthday flypast over London on loosing a panel he landed at RAF West Malling for temporarily repairs before returning to Thorney island. 29th October 1948 – Flown to Hawkers at Langley for overhaul. 20th April 1949 – On delivery back to Thorney Island from Langley LF363 made a wheels up landing, the repairs were done at Thorney Island. 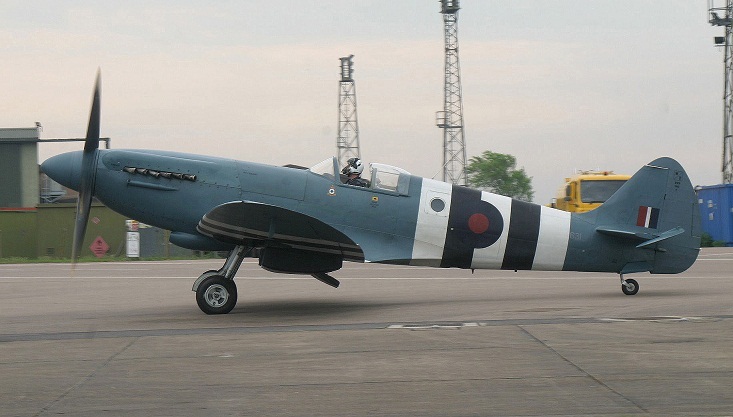 27th June 1949 – LF363 was painted Blue with a Red spinner for use as the personal mount of Air Vice Marshall Sir Stanley Vincent with his crest and 11 Fighter group badge on the side. September 1949 – LF363 lead the Battle of Britain flypast over London flown by Air Com Stanley Vincent. 28th November 1949 – LF363 was flown to Hawkers at Langley for storage. 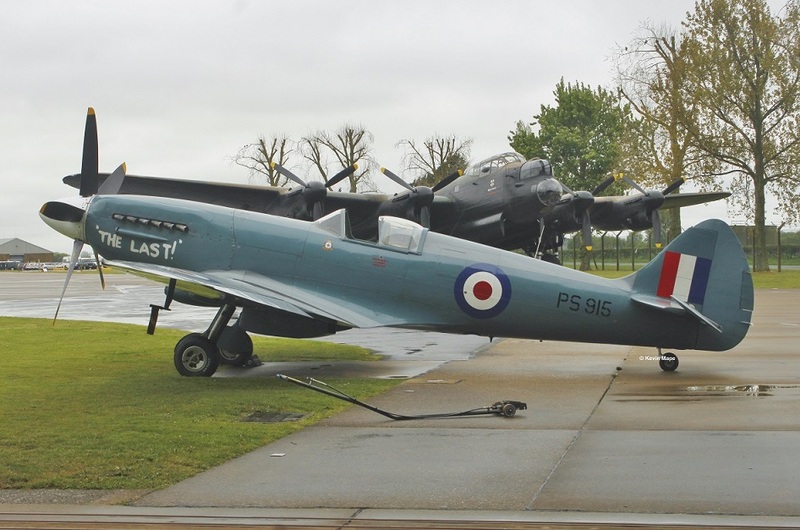 August 1950 – Hawker’s returned LF363 back to flight status. May 1951 – Flown to 19MU at St Athan for servicing, This found LF363 was needing mods and remove the cannon tubes in the wings.. 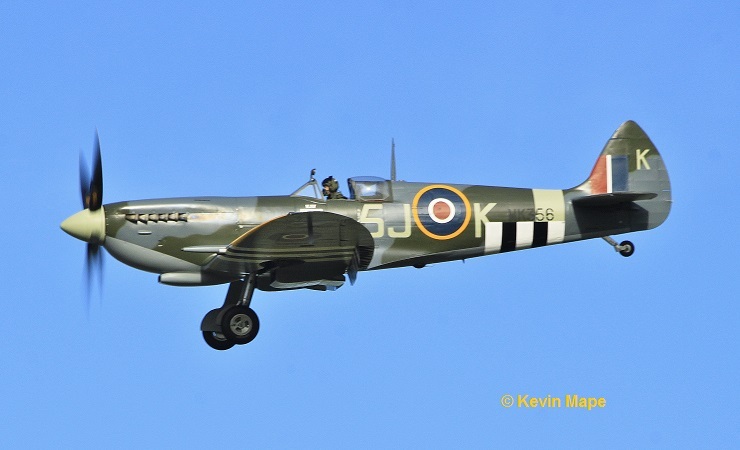 Flown to Hawkers at Langley for mods and painted in Camo markings with a water based paint. 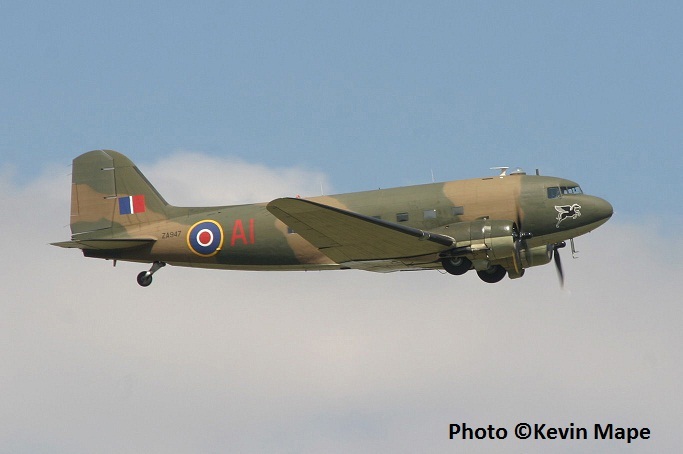 July 1951 – Flown to RAF Kenley Stn flt for use in the movie “Angel One Five” marked as P2615 coded US-B. 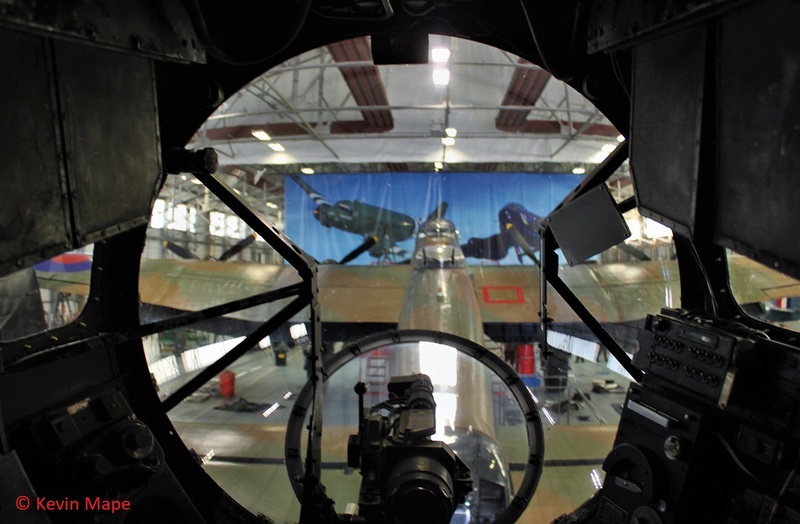 18th September 1951 – Returned to Hawkers for re-fitting of the Cannon tubes and return to Blue marks. 6th November 1951 delivered to RAF Waterbeach Stn flt. 1955 – Appeared in a BBC television series – The War In the Air. August 1955 – Returned to RAF Kenley Station Flight for use in the movie Reach for the Sky. September 1955 – LF363 was returned to Hawkers at Langley for a major overhaul and repaint to overall silver marking..
10th June 1957- Allocated to RAF Biggin Hill Stn flt. Transferred to the Battle of Britain Flight as it’s founder member, It’s first BoB duty was 15th September 1957 leading the Battle of Britain flypast over London. 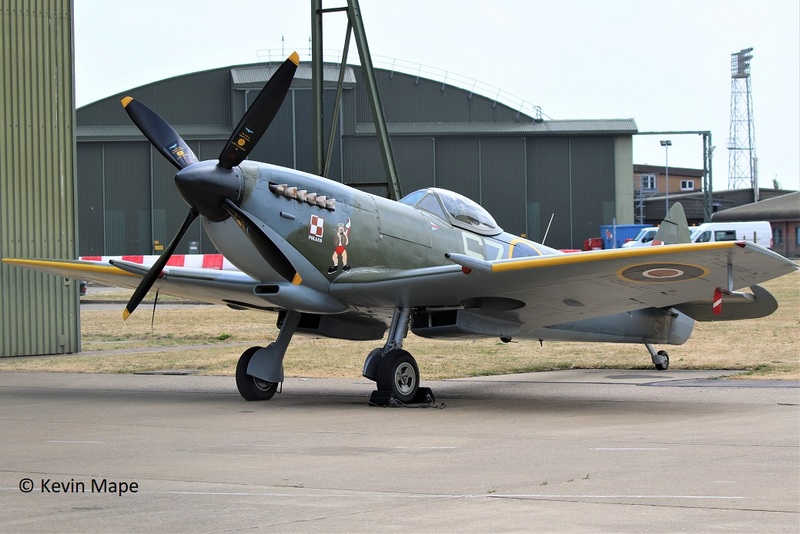 1957 – Flown to RAF Northolt for use in the filming of “The one that got away”. 1968 – Appeared in movie “Battle of Britain Film ” ,marks used in the film codes were F, MI-A, MI-D, MI-H, KV-C and serials H3420, H3421, H3422. Allocated marks 242Sqn/LE-D (thin) – Gp Cpt D.R.S Bader marks – 1969 – 1972. Allocated marks 242Sqn/LE-D (Thick) – Gp Cpt D.R.S Bader marks – 1973 – 1978. Allocated marks 249(gold coast)Sqn/GN-F Gp Cpt J.B.Nicolson’s V.C marks 1979 – 1982. Allocated marks 79Sqn/NV-L 1987 – 1989. Crashed and burned at RAF Wittering after engine failure, September 11, 1991. Rebuilt to airworthy by Historic Flying Ltd – 1994-1998. RAF Battle Of Britain Memorial Flight September 29, 1998. 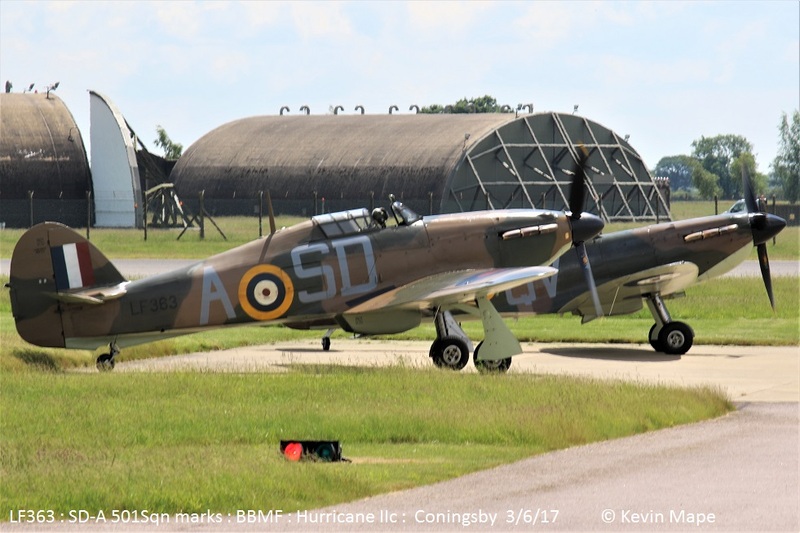 LF363 1(F)Sqn/JX-B with the prop and blue spinner loaned from PZ865- 4th May 2017 – 12th May 2017. Reverted back to Black spinner 13/5/17, this was taken 28/5/17. LF363 Allocated dual marks late May 2017 – starboard GN-F/249Sqn & Port SD-A/501Sqn – marks f/f 3/6/17 2017 – current. 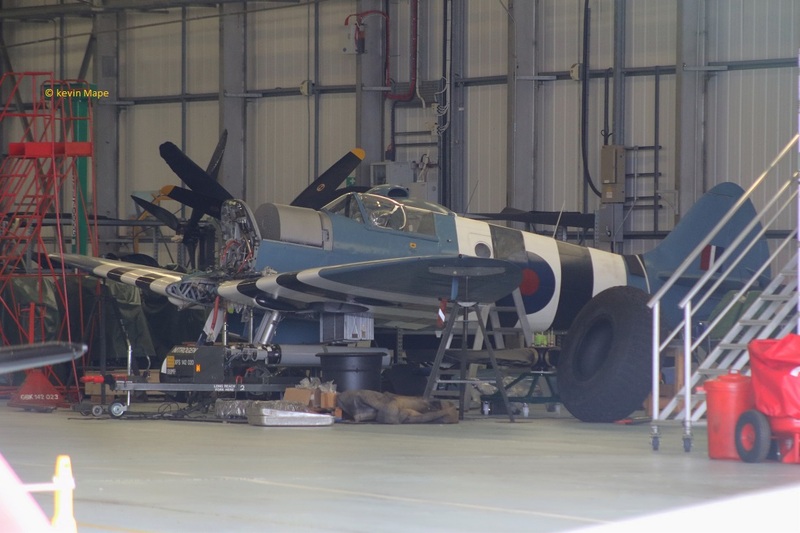 LF363 returned to it’s 1(F)Sqn makings coded JX-B for the 2019 season. First flight, Langley, July 22, 1944. Hawker Aircraft Ltd, Langley August 1944-1946 used for trails. Hawker Aircraft Ltd, Langley Open stored 1946 – 1950. Hawker Aircraft Ltd, Dunsfold, May 1 1950-1972. Registered as G-AMAU. Blue and gold marks : Race No.41. H3421, H3423, H3424 and OK-I. Allocated 34Sqn/EG-S SEAC marks 2012 – Current. 1940- Built by Supermarine at the Castle Bromwich factory Birmingham. 14th Spitfire built here. Rolls-Royce Merlin XII Engine -fitted. f/f 9th August 1940. 13th August 1940 – Delivered to Royal Air Force as P7350 – To 6 MU at RAF Brize Norton by Alex Henshaw. 17th Oct 1940 – Allocated to 603 (City of Edinburgh) Sqn/XT-W ? 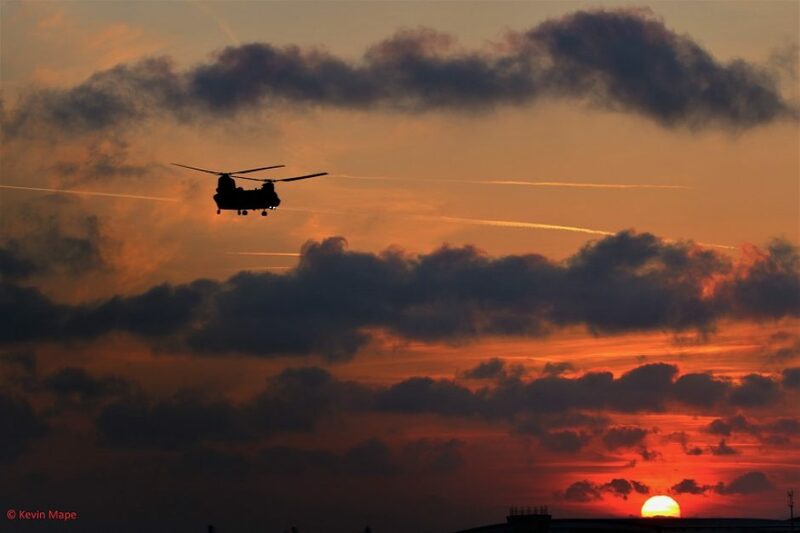 : Based at RAF Hornchurch, . 25th Oct 1940 –Force landing near Hastings after combat damage from a Bf109. Repairs to Cannon holes still in evidence until major service in 2008. December 7 1940 Allocated to 37 MU at RAF Burtonwood for storage . March 18 1941 Allocated to 616 (South Yorkshire) Sqn RAF Tangmere. April 10 1941 Allocated to 64 Sqn : based at RAF Hornchurch . August 1941 – Damaged in a Landing accident . August 5 1941 – To Scottish Aviation at Prestwick for overhaul & repair. Spitfire IIA was withdrawn from front line operational flying. April 27 1942 Allocated to Central Gunnery School Based at RAF Sutton Bridge. March 20, 1943 -Repaired and ready for collection at Hamble. March 23 1943 – Allocated to 6 MU at RAF Brize Norton, . April 30 1944 – Sent to AST at Hamble for repairs. 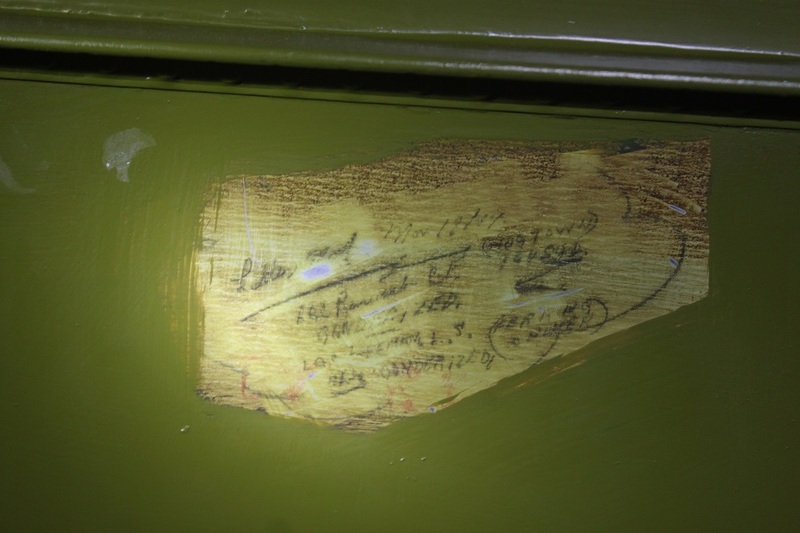 July 13 1944 – Repaired and awaiting collection from Hamble. July 24 1944 – Delivered to 39 MU RAF Colerne. Stored. July 8 1948 – Declared non-effective stock and sold for £25 as scrap to John Dale & Sons Ltd.
At this stage P7 had a lot of luck and was donated to RAF Colerne Collection by Dales. 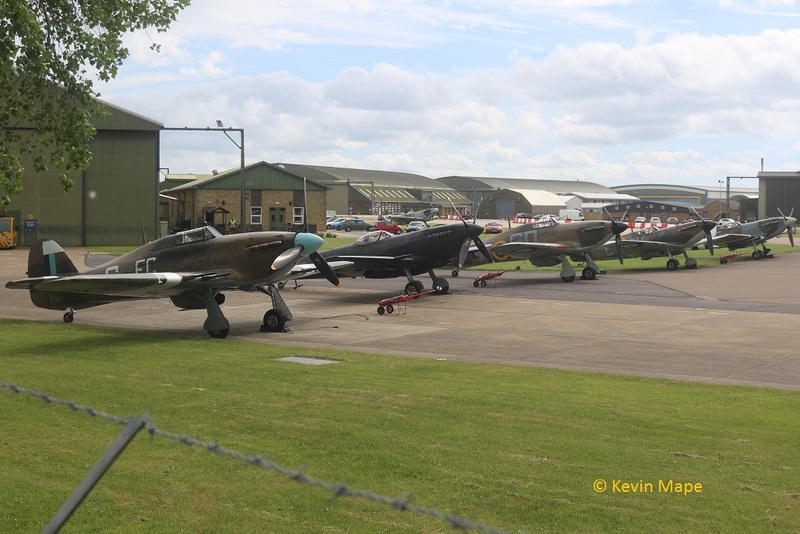 RAF Colerne Collection – Static display. April 25, 1968 – Registered as G-AWIJ to Spitfire Productions Ltd but the Ministry Of Defence retained ownership. serials N3310,N3312,N3317 & N3321 during the film with codes AI-A,AI-E,BO-H,CD-C & CD-M. When the filming was finished P7350 was returned to RAF..
October 1968 –Allocated to the Battle of Britain Flight Based at RAF Coltishall. November 5 1968 – Delivered to RAF Coltishall. January 1 1969 – Name change to Battle of Britain Memorial Flight. Allocated marks of 266 Sqn/ZH-T from 1969 until 1972. Allocated marks of 266 Sqn/UO-T from 1972 until 1977. March 1 1976 The Flight moved to RAF Coningsby. Allocated marks of 19 Sqn/QV-B from 1978 until 1981. Allocated marks of 266Sqn/UO-T from 1989 until 1990. Allocated marks of 65 Sqn/YT-F from 1991 until 1993. Allocated marks of 277 (Air Sea Rescue) Sqn/BA-Y from 1997 to Sept 2000. To RAF St. Athan for major overhaul, September 25, 2000. 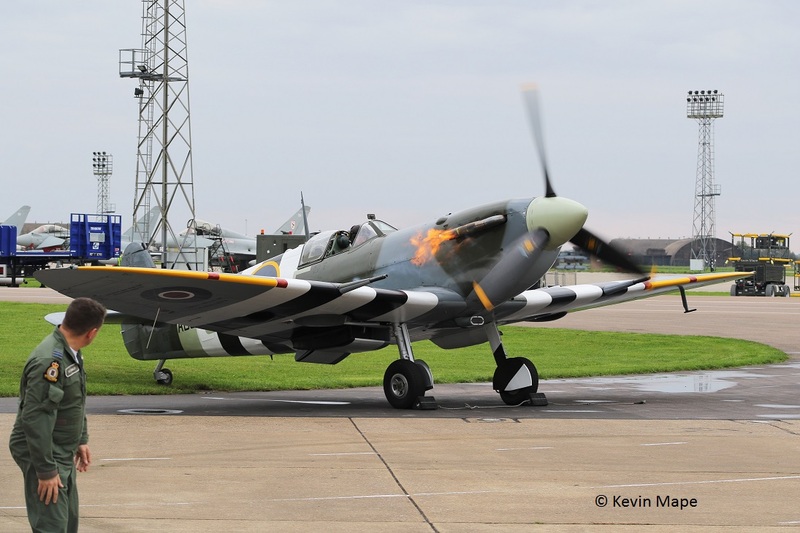 Delivered back to BBMF RAF Coningsby. – June 6, 2001. Allocated marks of 603(City of Edinburgh) Sqn/XT-L from 2007 until 2008. First test flight September 16, 2009. Allocated dual marks starboard side 92Sqn/QJ-G and Port side 19Sqn/QV-E marks f/f 3/6/17 – from 2017 . 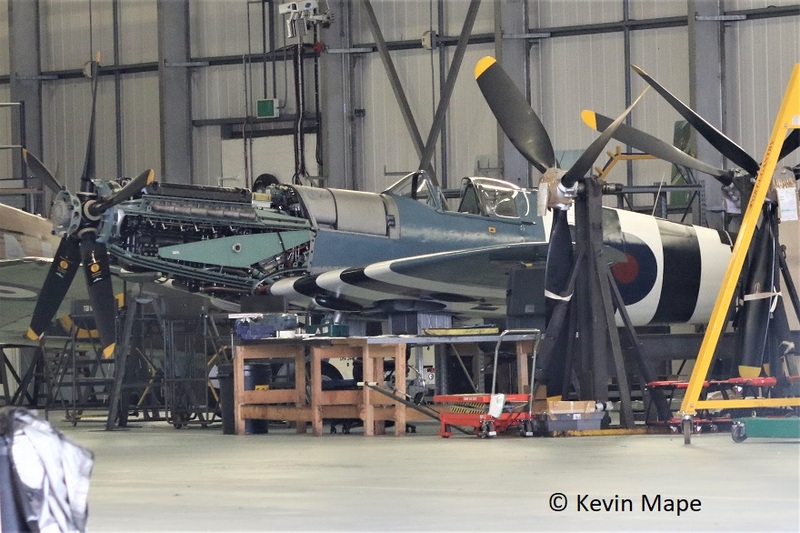 To Biggin Hill 21st November 2017 for overhaul by the Spitfire Company c/s “Spitfire 90”. P7350 will have markings of Al Deere’s 54Sqn “KIWI III” below each side of the cockpit coded KL-B. UK civil registered : G-AISU – 25th Oct 1946 – 22nd Aug 1955. History :Built by Supermarine at the Castle Bromwich factory Birmingham, 1941. 1941 – Delivered to Royal Air Force as AB910. August 22 – 1941 Allocated to 222(Natal) Squadron/ZD-C codes based at North Weald. Damaged in combat at the end of August 1941 in made a forced landing a Lympne. Repaired at AST Hamble it was flown to 37MU at RAF Burtonwood. Allocated to 130(Punjab)Sqn PJ- codes at RAF Perranporth Cornwall and flew 12 missions, Damaged in combat . 15th January 1942 – To Westland Aircraft Company at Yeovil for repair. June 1942 – Allocated to 133 (Eagle) Sqn/MD-E at RAF Biggin Hill it flew 29 missions. September 1942 – Allocated to 242Sqn/LE- H at Turnhouse in Scotland. November 1942 – Delivered to 12MU at RAF Kirkbride in Scotland. July 1943 – January 1944 Allocated to 416(RCAF) Sqn Based at RAF Trangmere. Allocated to 402(RCAF) Sqn/AE- codes based at RAF Digby. Allocated to 53 OTU at RAF Hibalstow. Allocated to 527Sqn at RAF Hibalstow. Allocated to Radio Warfare Establishment at RAF Digby. 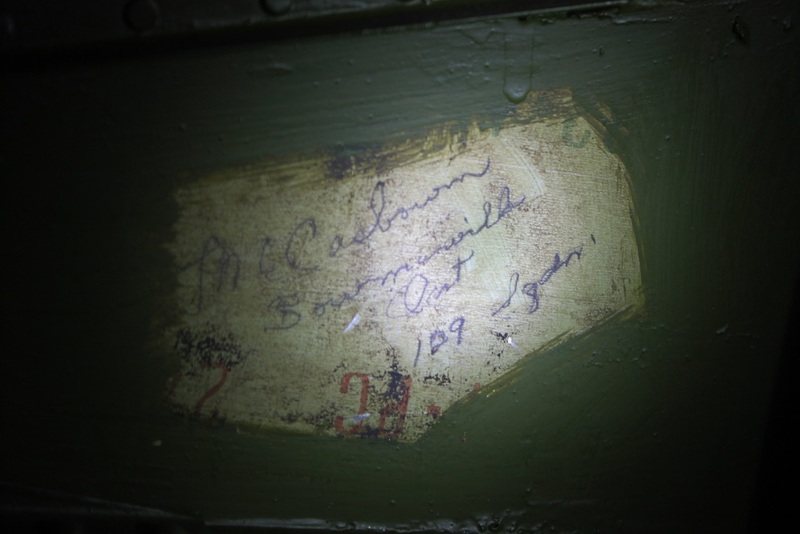 May 30, 1945- To storage at 29 MU RAF High Ercall. .
October 25th 1946. Declared non-effective stock and sold to Group Captain Allan H Weeler. 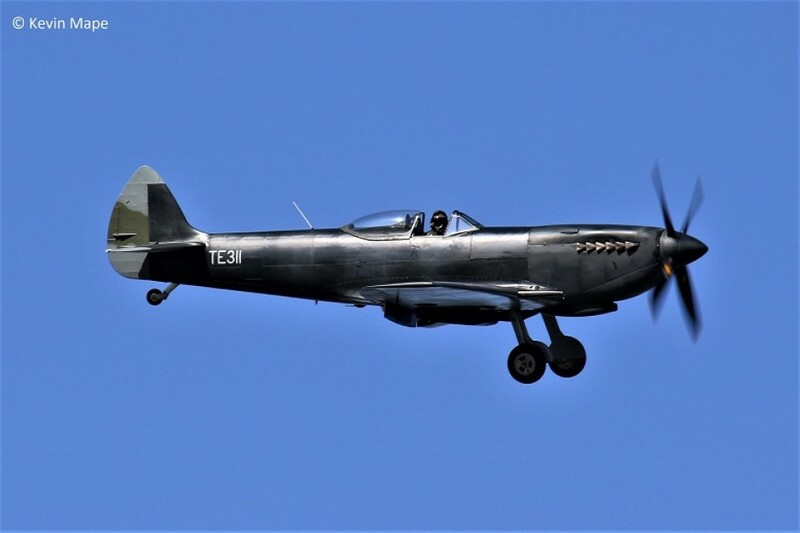 Group Captain Weeler used the Spitfire for Air racing- Flew as race #82, After a heavy landing at the 1953 Kings cup air race AB910 went sent to Vickers Armstrong for overhaul. 19th May 1955 Transferred to Vickers Armstrong at Bristol. 22nd August 1955 reverted back to Military serial AB910, It was flown by Test pilot Jeffery Quill at Displays on a regular basis. September 1965 Vickers-Armstrong Ltd., Weybridge, May 1955-1965. 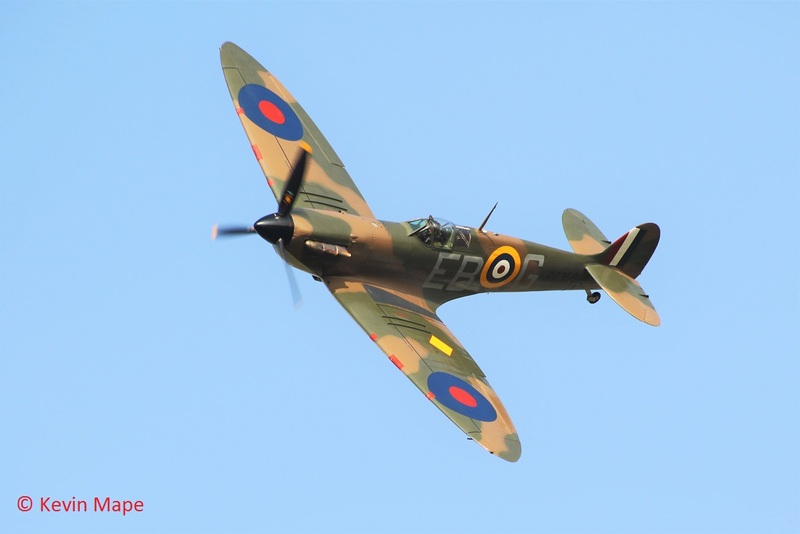 Donated to RAF – RAF Battle Of Britain Flight, September 15 1965- To date. Allocated marks 92Sqn/QJ-J(thin) 1965 – 1968. Flew in Battle of Britain Movie made in 1968. AI-M, AI-N, CD-D, CD-F, CD-K, DO-M. Returned to the RAF after the Film. Allocated marks 145Sqn/SO-T 1 969 – 1972. Allocated marks 92Sqn/QJ-J (Thick) 1973 – 1978. Damaged during landing at Duxford, June 1976. Badly damaged in ground collision with Harvard, Bex, Switzerland, August 21, 1978. Rebuilt and returned to Battle Of Britain Memorial Flight, October 26, 1981. To Cranfield for Servicing 1985. Restored to airworthy, Audley End. Allocated marks 133(Eagle)Sqn/XR-A. – First flight, March 3, 1997 in marks. Airfreighted to Nellis AFB, NV for airshow, April 1997. Restored at Duxford, UK, 2002-2003. 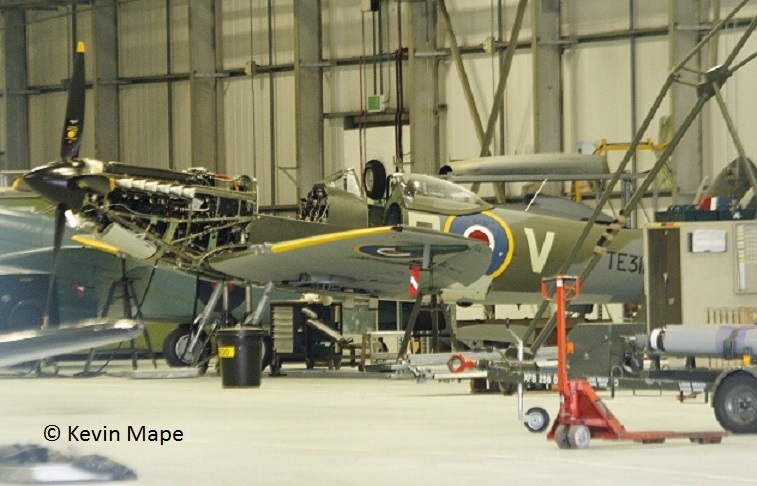 Restoration by Aircraft Restoration Company, Duxford, circa 2014-2015. Fitted with a Rolls Royce Merlin 66 Engine. 4th February 1944 – Delivered to 9MU at Cosford. 11thMarch 1944 – Allocated to 443(RCAF)Sqn B flight /21-V at RAF Digby. 18th March 1944 – 443(RCAF)Sqn B flight /21-V moved to Holmsey Marsh. 9th April 1944 – 443(RCAF)Sqn B flight /21-V moved to RAF Cosford. 14th April 1944 – MK356 flew it’s first Operation sortie over Paris. 23rd April 1944 – 443(RCAF)Sqn B flight /21-V moved to RAF Funtingdon. 14th May 1944 – 443(RCAF)Sqn B flight /21-V moved to RAF Ford. While with this unit it flew 60 sorties, Was damaged in combat 3 times. Credited with a half kill on Bf 109.
return from patrol F/O Gordon Monroe made a wheels up landing. Transferred to 84GSU at Bognor Regis for repairs (not completed) when unit moved to France. 1953-1958 RAF Hawkinge, – Displayed as gate guard as M5690 in a Silver scheme. 1958-1961 RAF Hawkinge, – Displayed as gate guard as M5690 then later MK356 in a Camo scheme. 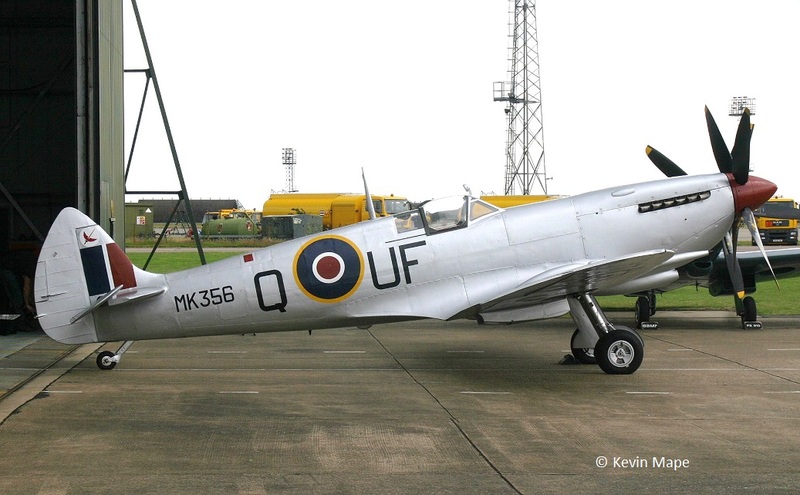 1967-1968 – Moved to RAF Henlow and converted to look like a Spitfire I for use in movie “Battle Of Briatin” in static scenes as N3328/ coded AI-R & N3317 coded BO- used in filming at North Weald & Duxford. 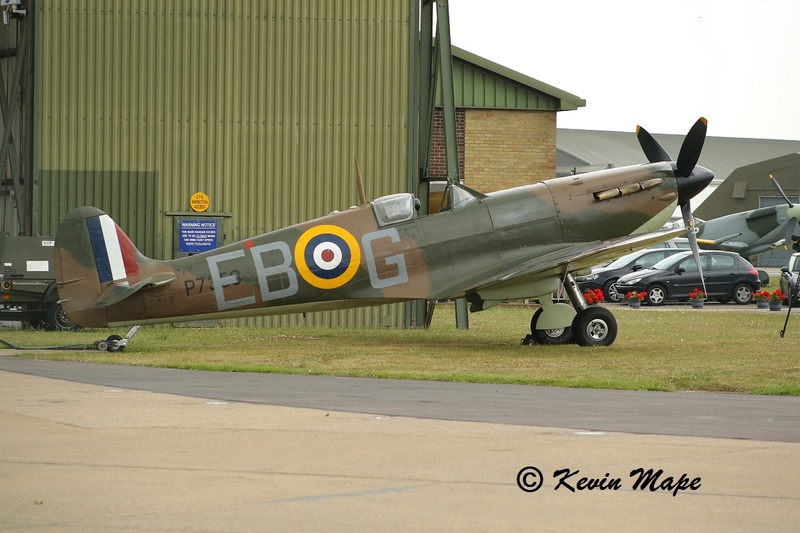 August 1968 – Returned to RAF Henlow and converted back to Spitfire MkIX standard then Stored until the 18th Aug 1969. 1991-1997 – Restored to airworthy, RAF St. Athan fitted with clipped wings from SL674. November 7 1997 – First flight. 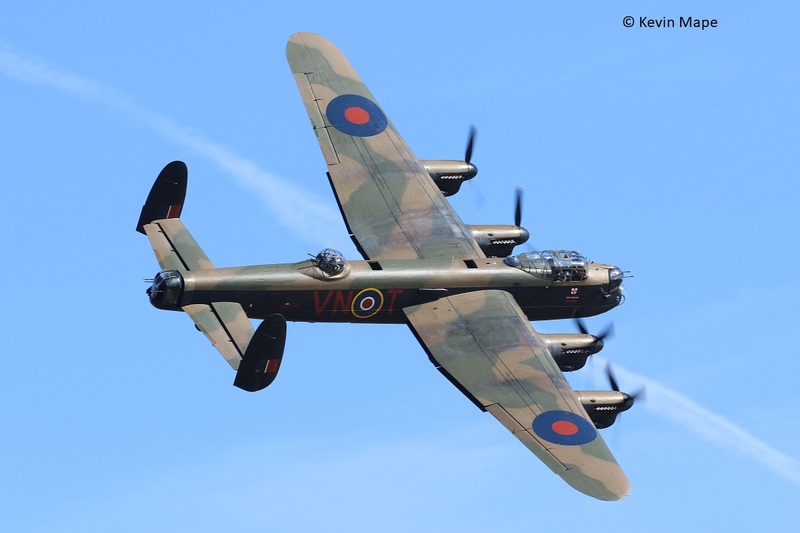 November 14 1997 –Delivered to the BBMF at RAF Coningsby. Allocated marks all silver scheme of No 601 (County of London) Sqn/UF-Q 2008 – 2012. To Duxford for servicing and repaint. 2012 – 2013. 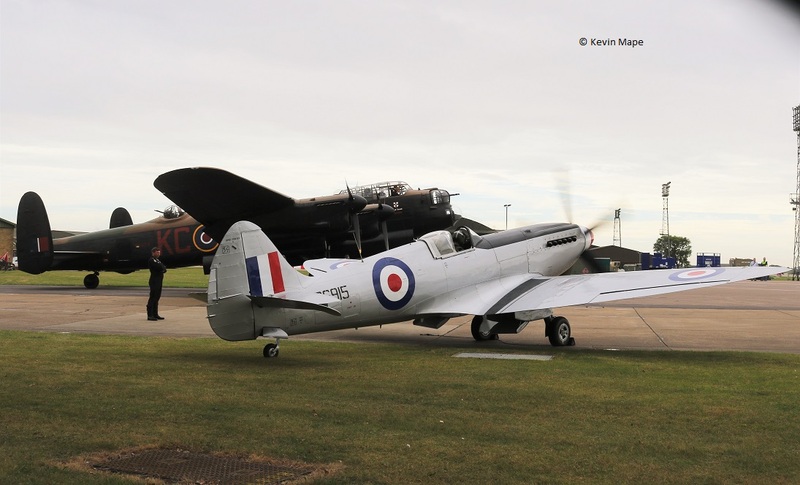 17th October 2013 – Returned to BBMF in 126Sqn marks with the wrong coloured Spinner. 2013 – 2017 Allocated marks 126Sqn marks/5J-K “KAY”. 1/3/17 – To Biggin Hill for overhaul and repaint. Delivered back to Coningsby 8/11/17 in Desert Camo 92Sqn/QJ-3 markings. First flight of the 2018 season was on the 20th April. MK356 displaying at the LLA day 29th September 2018. History : Built by Vickers-Armstrong at Reading, UK, late 1945. Engine: fitted with a Rolls Royce Griffon 66. 6th November 1945 – Delivered to 6MU at RAF Brize Norton. 6th May 1949 – 13th January 1950 – Delivered to 203 Advanced Flying School at RAF Driffield. Spent a short time at Buckeburg Air Base in Germany before returning back to 9MU at RAF Cosford. 2nd July 1951 – Delivered to Short Brothers at Hooten Park, – Assigned to Meteorological Research Flight. Delivered on June 14 1957 –Memorial Flight at RAF Biggin Hill. PM631 was loaned to Central Fighter Establishment in 1964 at RAF Binbrook for use against BAC Lightnings to train pilots that might come up again P-51D mustangs in Indonisia. 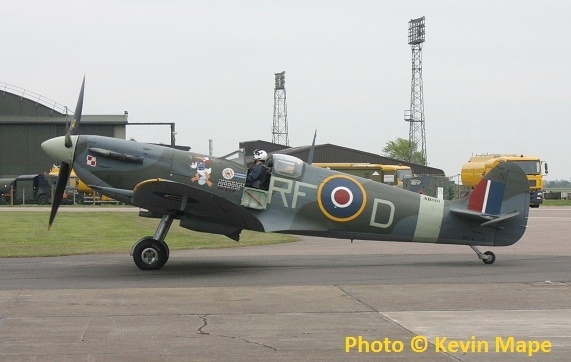 1968 -Flown to RAF Henlow and loaned to Spitfire Productions for conversion to look like a Spitfire Mk 1 for the film Battle of Britain. 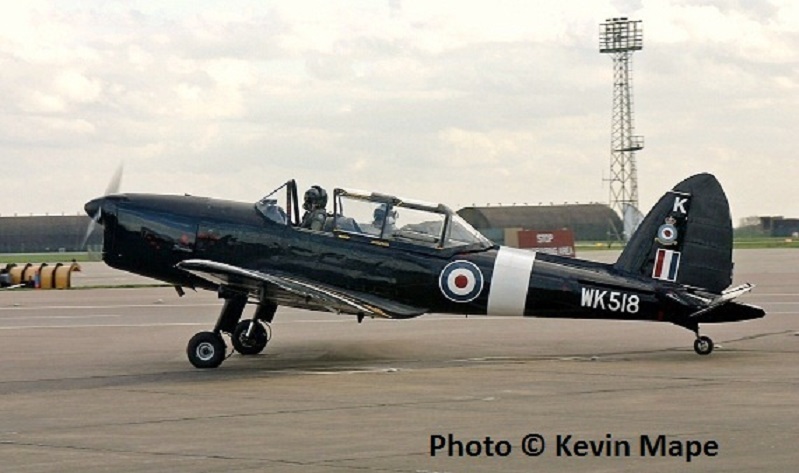 Flown in movie Battle of Britain in 1968 with serials N3317, N3320, N3329 and codes AI-S, BO-S & DO-N.
August 1968 – Returned to RAF Henlow and converted back to Spitfire PR XIXe standard. 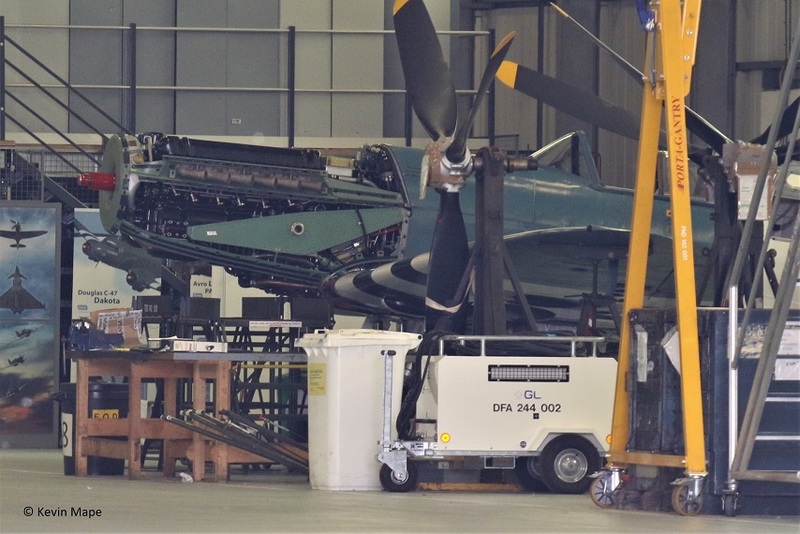 21st July 2018 – the new Griffon engine is in place. Another update September 7th 2018. Engine runs have started with a first flight not far away..
UK civil Registered – G-RRGN 23 December 1996 – Current. Rolls Royce Griffon 58 engine fitted. January 13, 1945 – Delivered to Central Photographic Reconnaissance Unit at RAF Benson. February 1945 -Delivered to 16Sqn at Melsbroek Belgium. Delivered to 268Sqn this Sqn was then renumbered to 16Sqn on the 18th December 1945. 18th September 1945– 16Sqn at Crelle France. March 1946 – Delivered to 29MU at High Ercall for storage. 17th January 1949 – Cat B damaged in a flying accident. 9th March – Delivered to Vickers at Southampton for repairs. February 29 1950 – Delivered to 6 MU at RAF Quedgeley. July 1950 – Delivered to Short Brothers at Hooten Park. Assigned to Meteorological Research Flight.- Final flight June 9, 1957. November 8 1957 – Delivered to 32 MU at RAF St Athan . December 20 1957– Delivered to Biggin Hill Station flight. March 1 1958– Delivered to North Weald Station flight. April 14th 1958 – Delivered to Central Fighter Establishment at Binbrook to fly against BAe Lightning as the Lightning may come up against P-51 Mustangs in Indonisia. 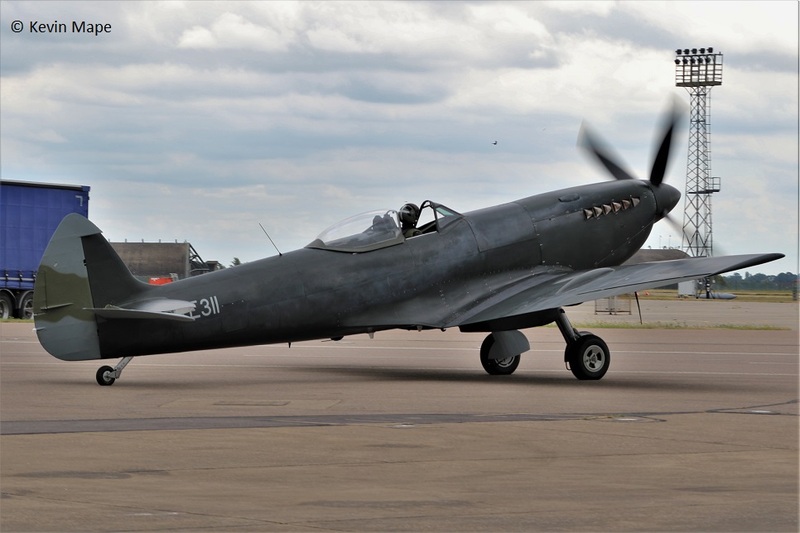 Delivered to 19 MU at St Athan – Restored to flying condition. Delivered to RAF West Raynham November 1962-1964. April 14 1964 -Transferred to BBMF at RAF Colishall , 1964 – 1968. 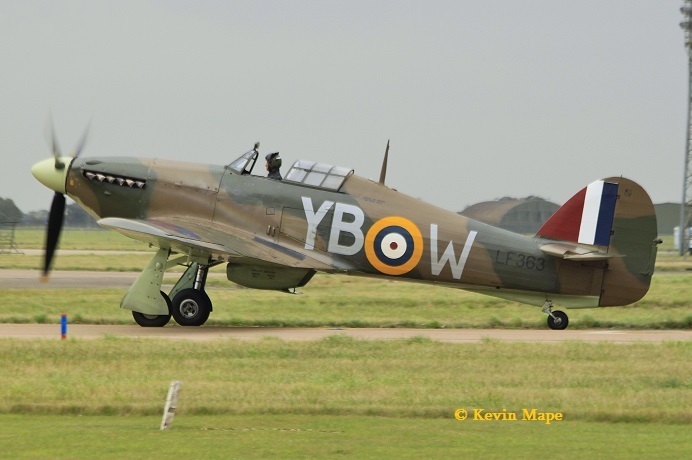 Flown in movie Battle of Britain with Serials N3314, N3316, N3319,N3321 codes worn – AI-E, AI-G, AI-M, CD-C, EI-K . Returned to the BBMF September 1968. Sold to Euan English, North Weald February 17, 1995-1996. 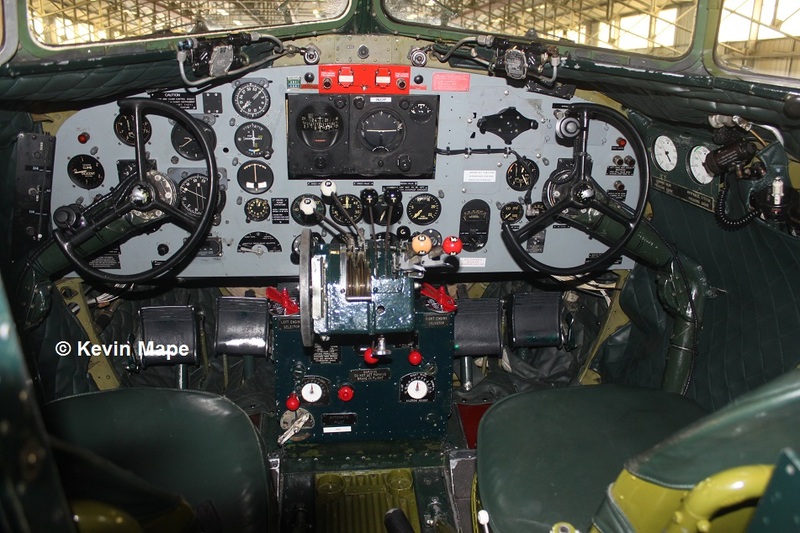 Sold to Rolls Royce PLC, Corporate Heritage Dept, Bristol-Filton, 1996- Current. PS853 departing Coningsby on the 3rd July 2008. Registered as G-RRGN, December 23 1996. – Flown in blue RAF scheme as PS853/C in 16Sqn marks. Based at East Midlands Airport. 21stJune 1945 – Delivered to 541Sqn at RAF Benson on 1 it was issued nine days later to RAF Benson. 29th December 1945 – Delivered to No.1 Pilots Pool at RAF Benson. 22nd July 1946 – Delivered to PR Development Unit at RAF Benson. 10th October – Delivered to No.151 Repair Unit Wevelgem Belgium. Damaged declared Cat.3R on 30th April and again on 6th August 1952. Took 22 Months to Repair. 4th June 1954 – Delivered to the THUM Flight at Woodvale, 1954 – 1957. 13th June 1957 – Delivered to Historic Flight at RAF Biggin Hill and WFU. 31st August 1957 – Delivered to RAF West Malling as a Gate guard as 7711M 1957 – 1960. RAF Leuchars – Gate Guard 1961 – 1967. 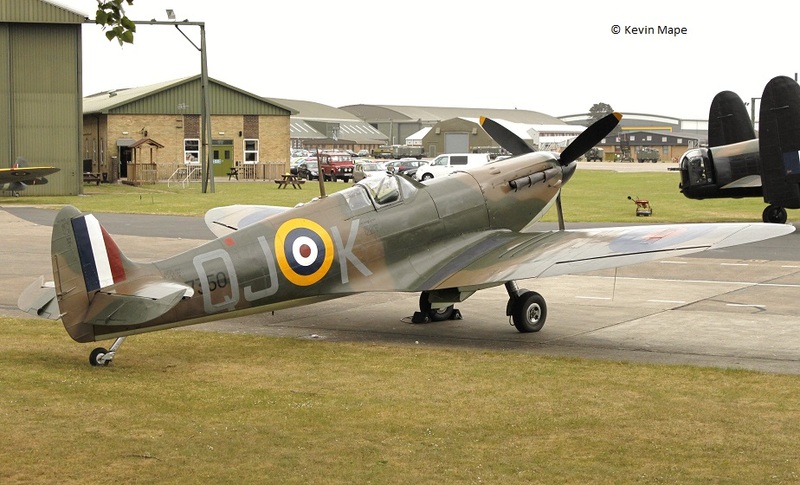 1967 Delivered to RAF Henlow and converted to look like a Spitfire F 1 for the Film Battle of Britain. 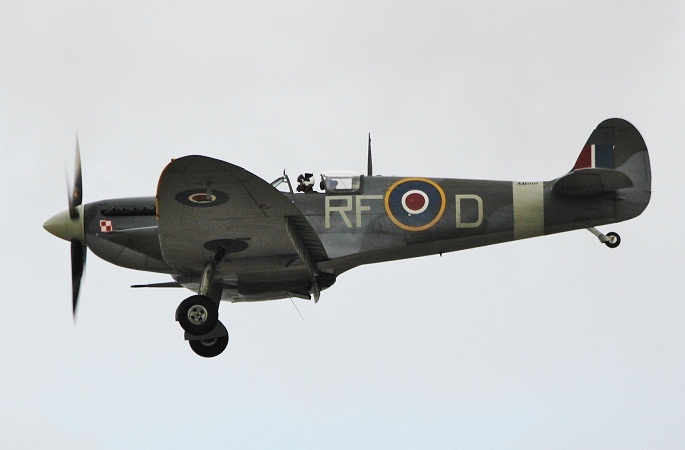 1968 Loaned to Spitfire productions , Used as a static Spitfire in the Film Battle of Britain. September 1968 – Returned to RAF Henlow reconverted to PR XIX. 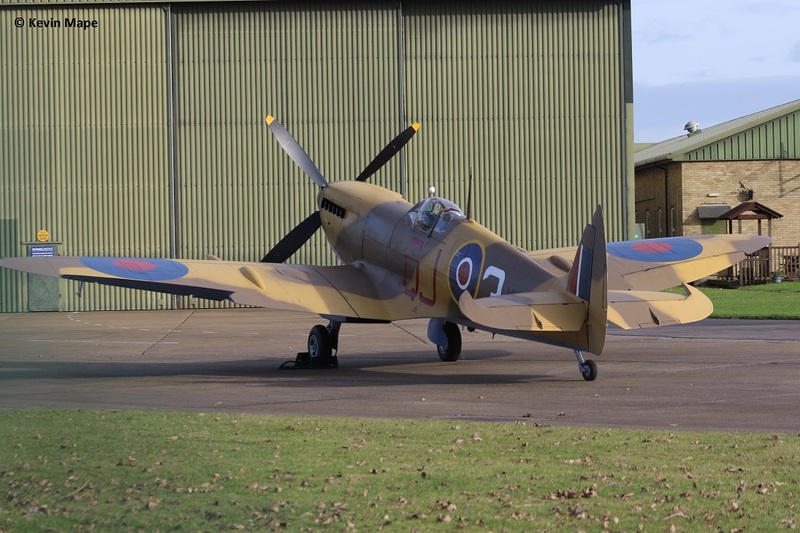 Delivered to BBMF at RAF Coningsby and used as engine test bed. 1975 – 1980. Delivered to Duxford for Overhaul by ARC and repaint. 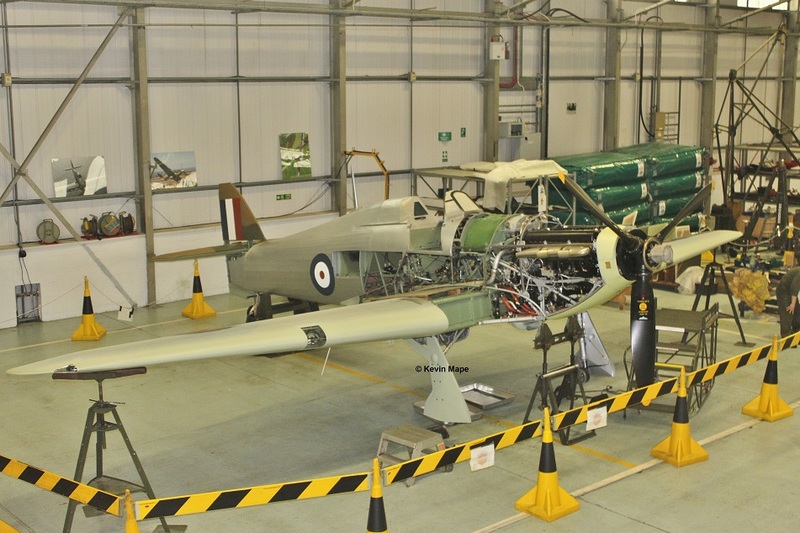 TE311 was delivered to Coningsby to be broken to spares but had a 12 years restoration to full air worthiness by the BBMF. Delivered to No.39 MU Colerne on 16th June 1945 and placed in store. Allocated to No.33 MU Lyneham for storage. Here it remained until 1951. Allocated to No.1689 FPT Flt at RAF Ashton Down on 31st May 1951. 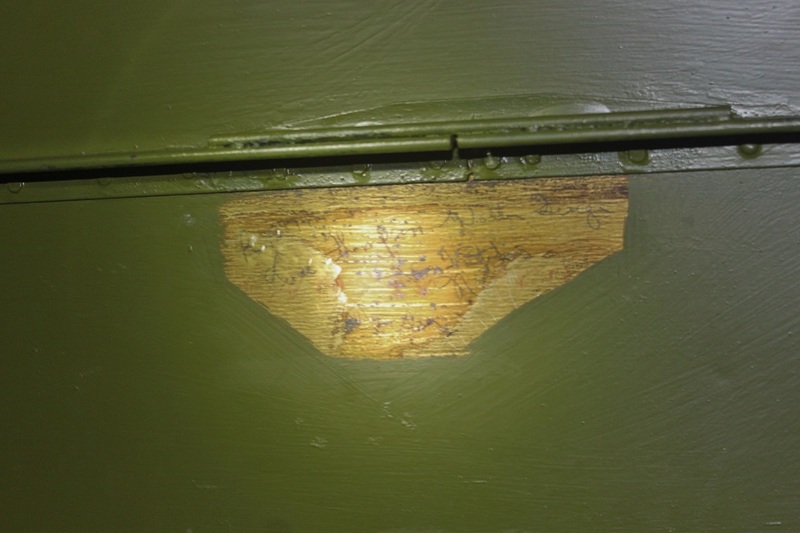 Repairs were completed by Vickers Armstrong – 13th December 1951. Delivered back to to No.1689 FPT Flight at RAF Ashton Down on 31st December 1951. Allocated to the Ferry Training Unit at RAF Benson on 9th April 1953.
and transferred to non-effective stock on 13th December 1954 . Placed on the main gate at RAF Tangmere 11th August 1955 – 1967 in Silver scheme. 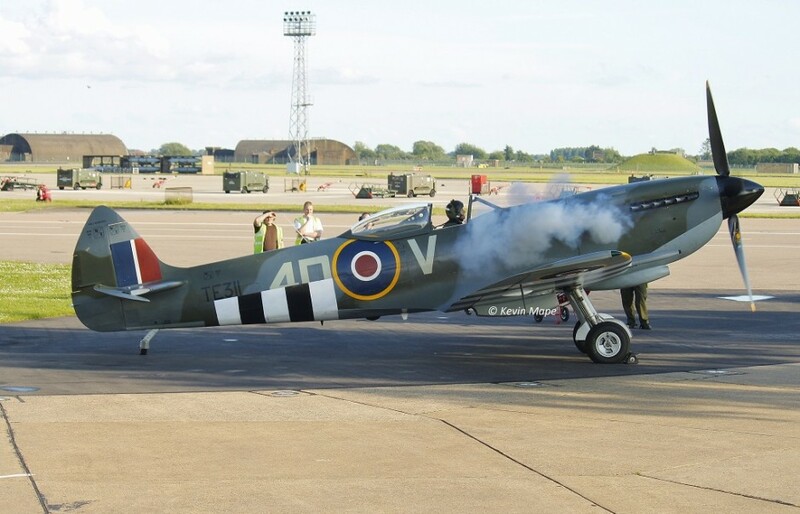 Loaned to Spitfire Productions Ltd for The Battle of Britain and delivered by road to Henlow in 1967. It was restored to Taxying condition and modified with false rear fuselage to resemble a Mk I. It was used at both North Weald and Duxford during 1968 and used serial N3321 & N3324 and codes AI-C, AI-M, DO-H.
11th August 1968 – To RAF Henlow and returned to LF XVIe standard for display at RAF Benson. September 1968 – it was exhibited at the Battle of Britain Display on 20th September 1968. Allocated to Abingdon as part of the RAF Exhibition Flight. During its time here it was loaned to SERCO in Wolverhampton. 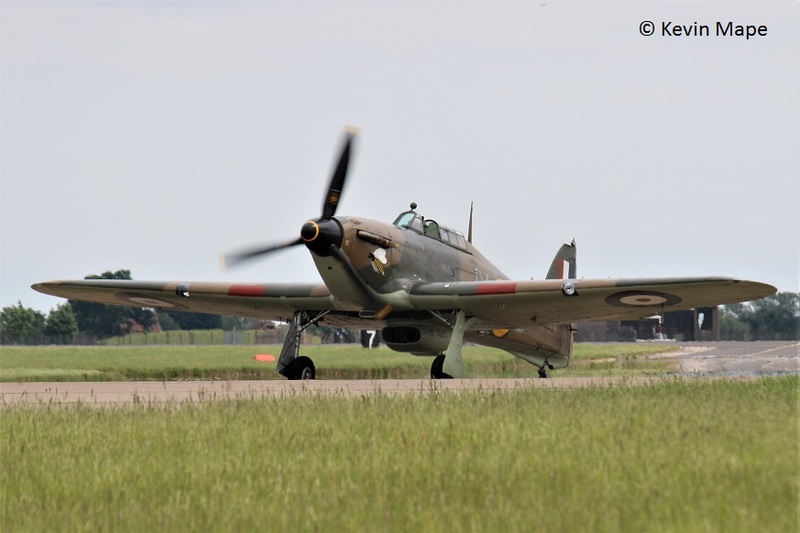 Loaned to the Bayeux Museum in France where it flew as MK178/66Sqn/LZ-V.
October 1999 – The aircraft was transferred to the BBMF dismantled for spares along with TB382. In 2004 restoration work began on TE311 . After 12 years of painstaking restoration TE311 made its first post restoration flight on 19th October 2012. Allocated marks 74Sqn/4D-V, of Sqn Ldr Tony Reeves DFC, the OC of No 74 Sqn in 1945. 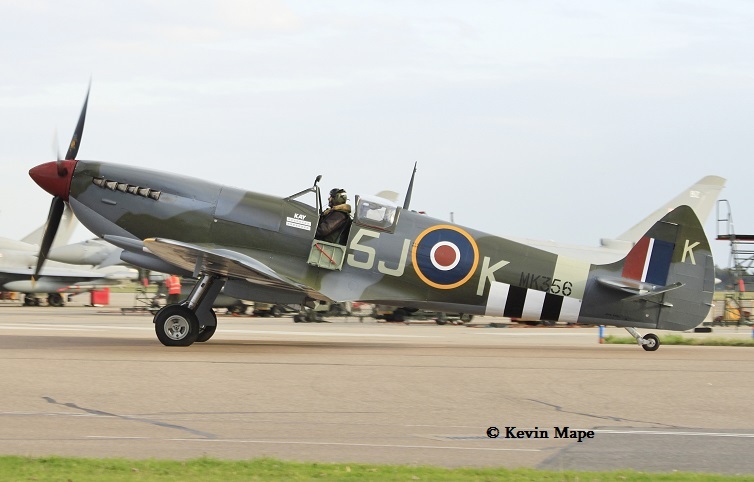 For the 2015 season invasion stripes were added as a reserve aircraft for 70th Anniversary of D Day season. Feb 2017 – TE311 had it’s paint removed and was painted in a black undercoat. 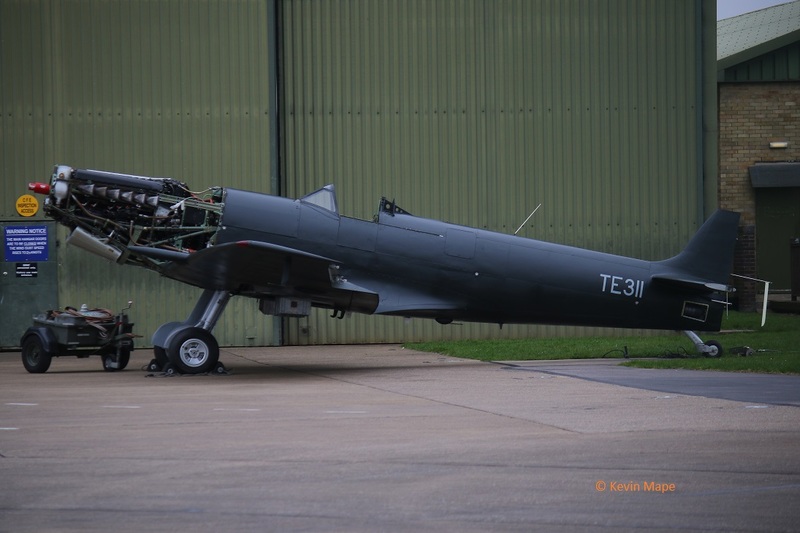 29th April 2017 – TE311 was test flown still in matt black undercoat, The undercoat will remain for the 2017 season. TE311 started the 2017 display season still in black undercoat, Coningsby 24/6/17. 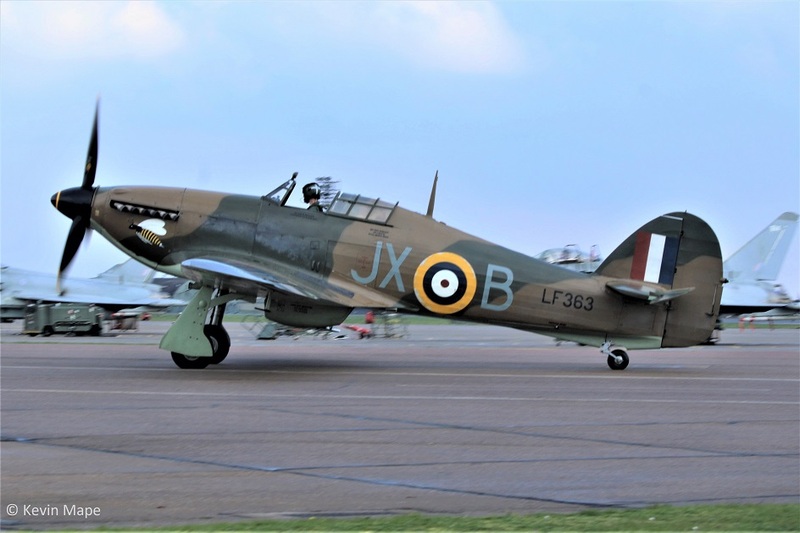 Repainted at RAF Coningsby March 2018 and returned to BBMF Hangar. 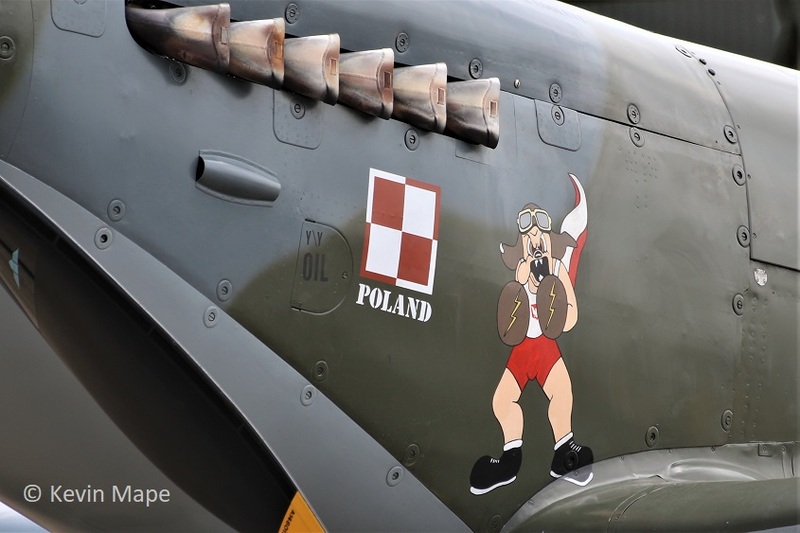 Allocated marks : 131(Polish) Wing /SZ-G flown by Group Capt Aleksander Gabszewicz between April 1945 – June 1945. Taken on engine test 13/4/18. Picture taken at the LLA day 29th September 2018. History : Rolled off the Production line 31/5/45 at Vickers Armstrong at Broughton Chester. First flown August 1945 – Converted to Mk.I FE (Far East) for Tiger Force. Delivered to 38 MU at Llandow . 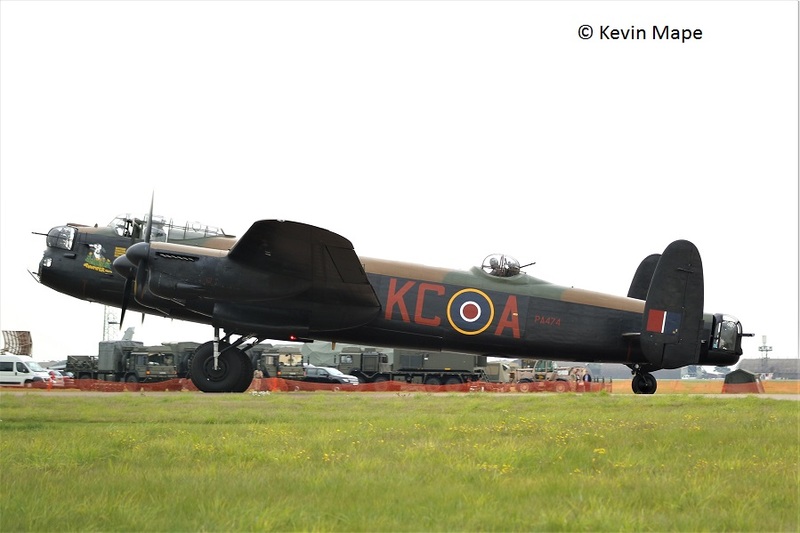 26/4/46 -Delivered Vickers Armstrong at Bagington for conversion to Mk 1 (PR),This included the removal of the Gun turrets,, Solid metal roof to the Cockpit, Fitting of 2 K17 Cameras, Provision for Radar, A second Pilot station was also added and The Lancaster was stripped back to bare metal. 8/48 – Returned to 38MU at Llandow. 9/48 – Allocated to 82Sqn/M and delivered to RAF Benson for and was used in South & East Africa on Photo Survey work operating from Takoradi West Africa. 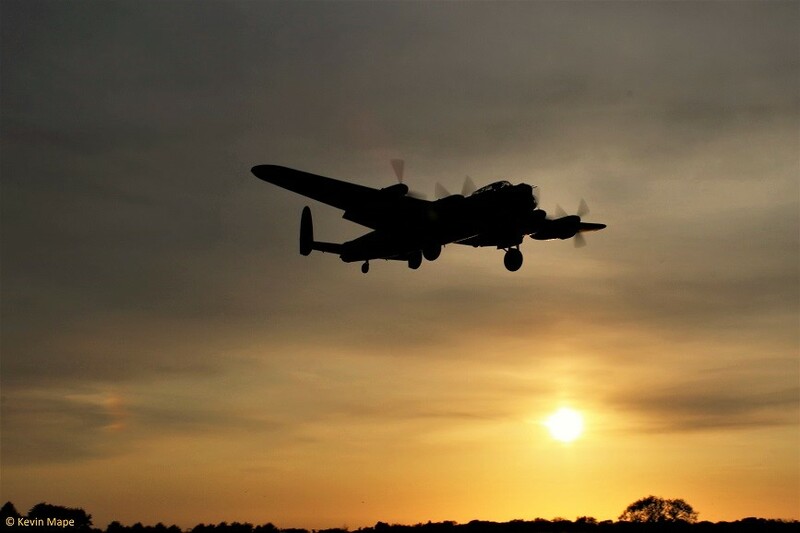 2/52 – Returned to the United Kingdom with over 2000 hours on the frame PA474 had a major service then returned to 82Sqn. 8/52 PA474 was loaned out to Flight Refuelling Ltd at Tarrant Rushton as a Pilotless drone but was not used, They used a Avro Lincoln instead. 10/52 – Delivered to Royal College of Aeronautics for Handley Page Laminar Flow wing trials, The trial wings were mounted on the top rear of the Fuselage. 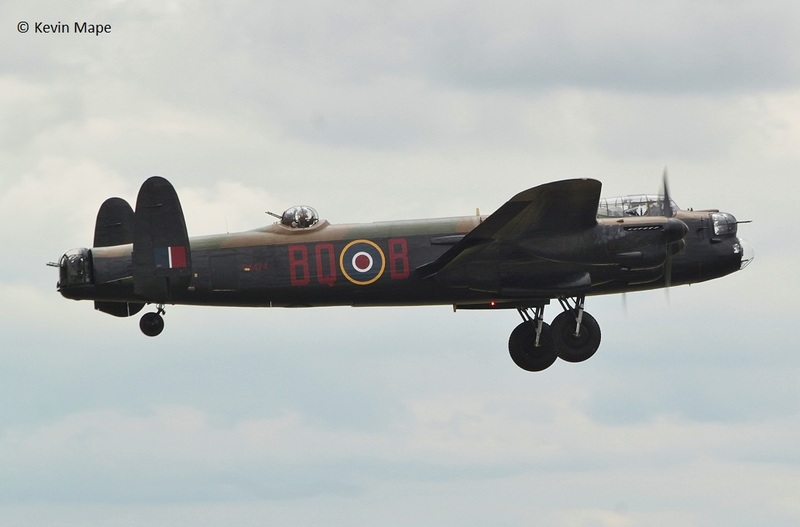 The Lancaster was later replaced by an Avro Lincoln RF342. April 1964 – PA474 was adopted by the Air Historical Branch (AHB) for future display in the RAF Museum at Hendon, After removal of all the Test equipment at Cranfield she departed to Woughton. Delivered to 15MU at Wroughton for restoration and repaint back to WW II camo. 1964 – PA474 was used in the filming of The Guns of Navarone. 1964 – PA474 was used in the filming of Operation Crossbow. 1964 – Flown to RAF Henlow in preparation for display at RAF Museum Hendon. 1965 – The CO of 44Sqn based at Waddington asked the AHB in 44Sqn if the Lancaster could be transferred to RAF Waddington, After inspection PA474 was granted permission for a delivery flight from Henlow to Waddington 18th August 1965. Between 1966 and 1967 a restoration programme for PA474 commenced and would take about two years to complete. 1967 – With both front and rear gun turrets in place PA474 was made airworthy and was flown on a regular basis by 44Sqn , Restoration continued. Allocated marks 44Sqn/KM-B. This was the first Sqauodron to receive Avro Lancaster’s. November 1973 – PA474 joined the Battle of Britain Flight at RAF Coltishall , This prompted a change of the Unit’s name to the ‘Battle of Britain Memorial Flight’. Restoration has been on going ever since. In 1975 a Mid upper turret was found in Argentina and shipped back to the UK in HMS Hampshire, This was installed into PA474 the same year. PA474 was adopted by the City of Lincoln and their coat of arms were added to the front on the port front side. 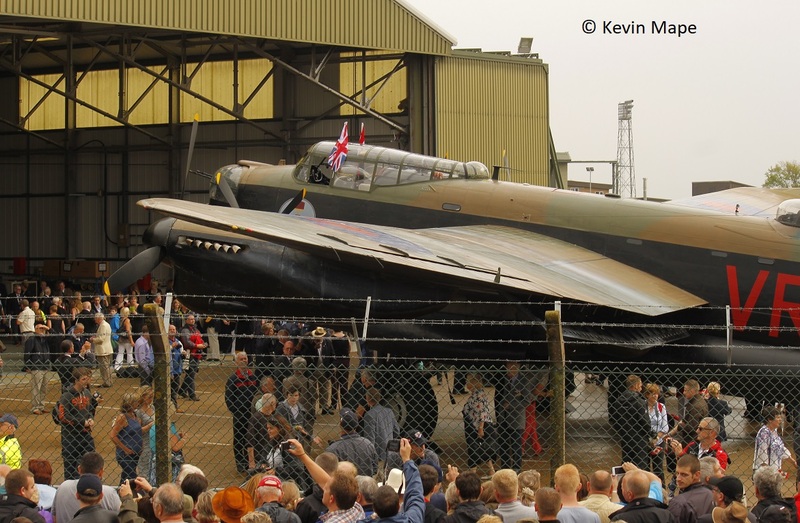 1st March 1976 – The Battle of Britain Memorial Flight moved from RAF Coltishall to RAF Coningsby, It’s present Home. September 1979 – PA474 was flown to RAF Lynham for repaint. Major service was undertaken by West County Air Services at Exeter Airport. During the Winter of 1995 a new main spar was fitted. 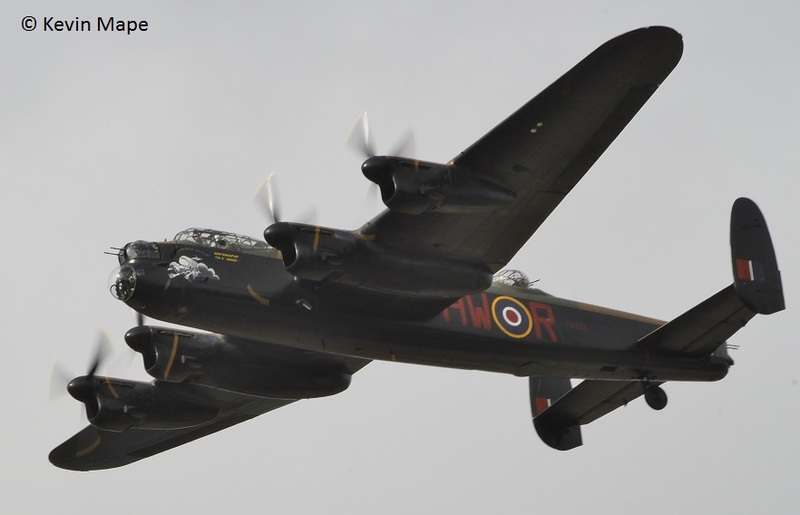 BBMF added four Poppy symbols to the Lancaster to denote the four Poppy drops made. 1st – 50th Anniversary of VE-day. 2nd -50th Anniversary of VJ-Day. 3rd – 60th Anniversary of D-Day. 4th – 60th Anniversary of the end of WW II. The poppy symbols have been worn ever since no matter what the marks carried. Major Service undertaken by Air Atlantique at Coventry over the Winter of 2006 – 2007. 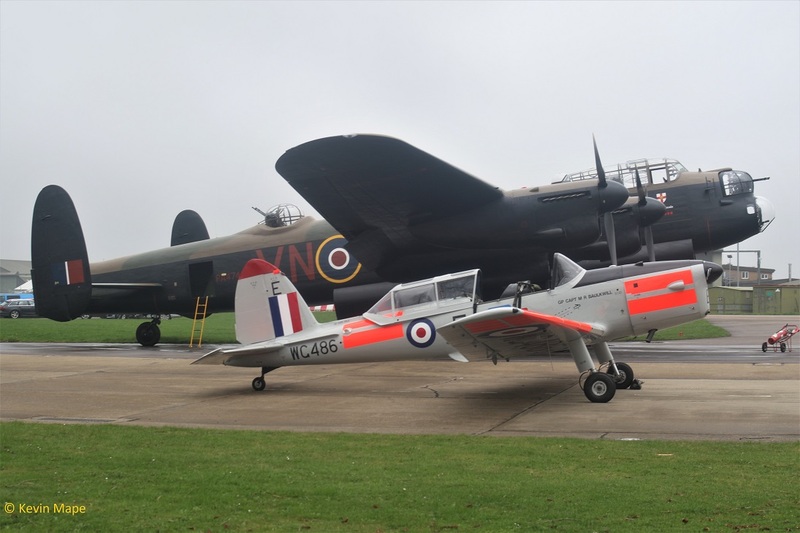 August/Sept 2014 – PA474 & FM214 CWH flight flew together at events around the UK. 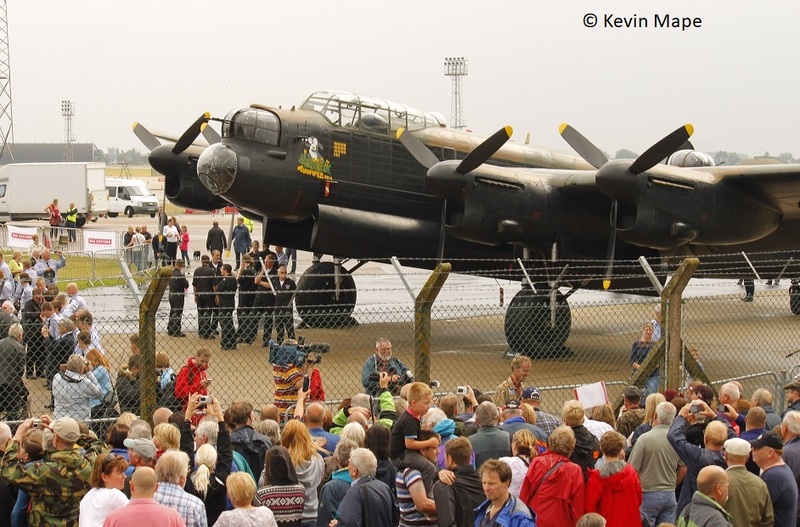 FM214 arrived at Coningsby to a big welcome on a rainy day. 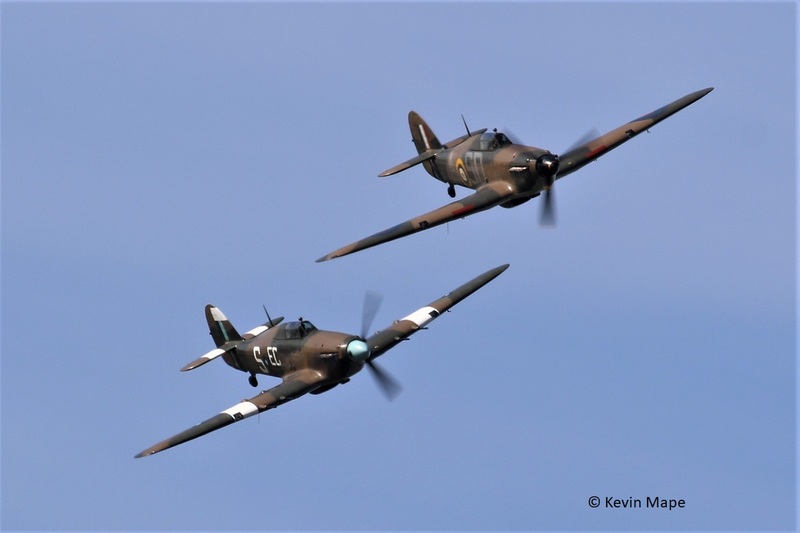 The first flight together at Coningsby. 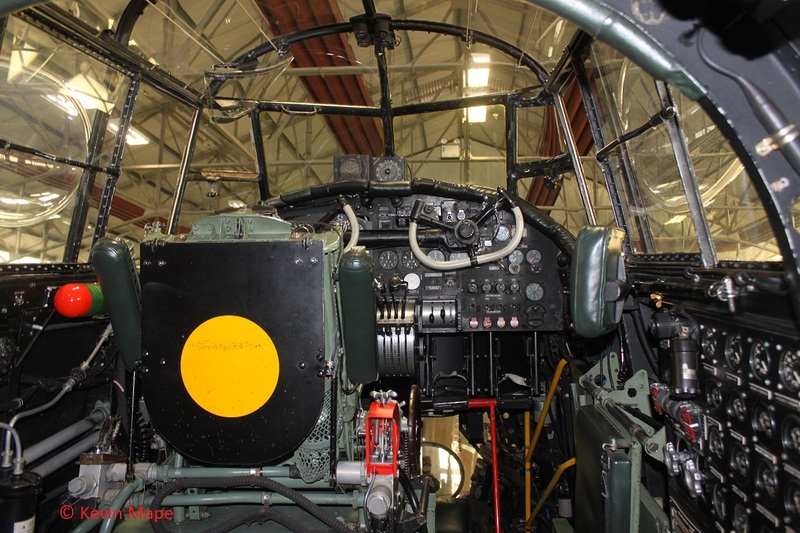 Towards the end of the CWH Lancaster tour I was able to visit both Lancaster’s on 18th September while in the BBMF Hangar. FM214 taken from the bomb aimers station in PA474. 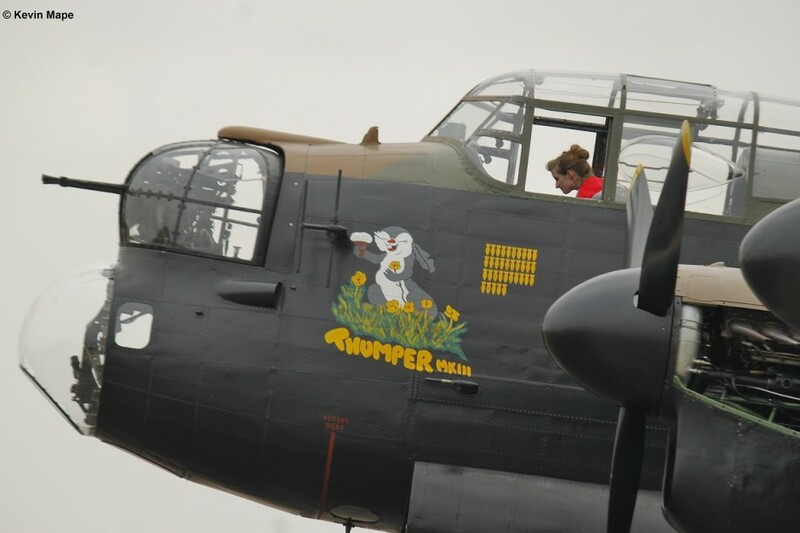 Thumper III showing it’s five poppy drops under the City of Lincoln coat of arms. 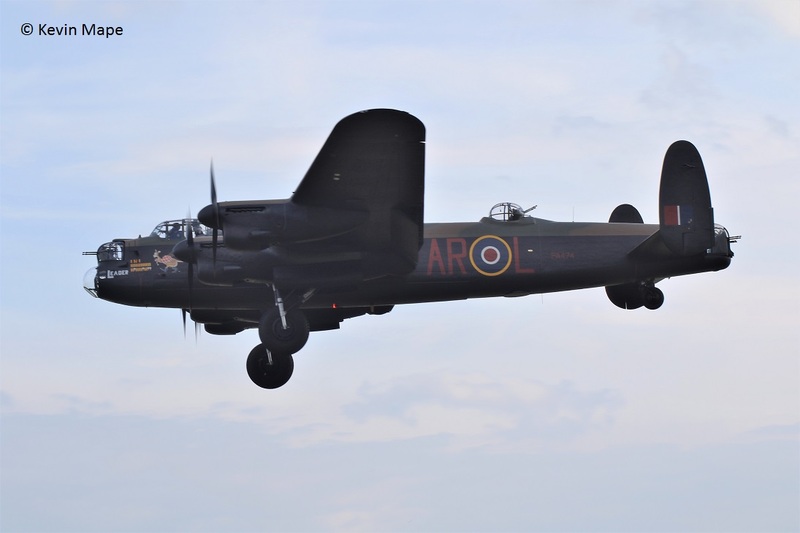 7th May 2015 The Lancaster developed a fire in No.4 engine while performing a display practice with a Spitfire and Hurricane at RAF Coningsby , She was landed safely and the crew exited the burning plane. RAF fire service put out the fire . 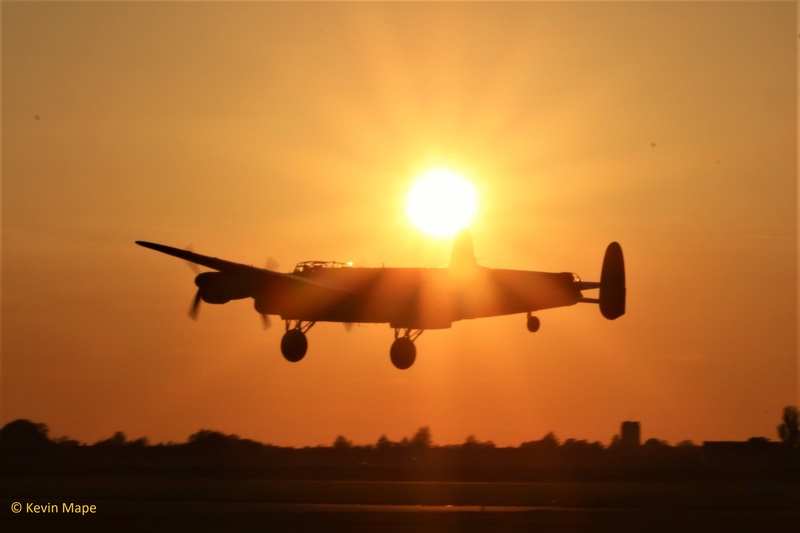 The Lancaster did not fly again until 14th October. 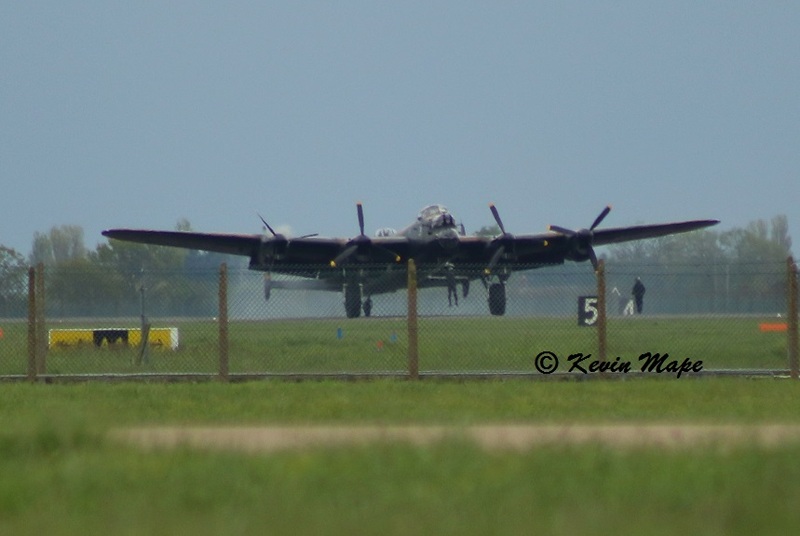 Just after the Lancaster landed and switched off the engines, You can see the crew are exiting from the hatch at the front under the nose and the Navigator left by the rear door, He is standing on the right . This was just before the Fire tenders arrived. 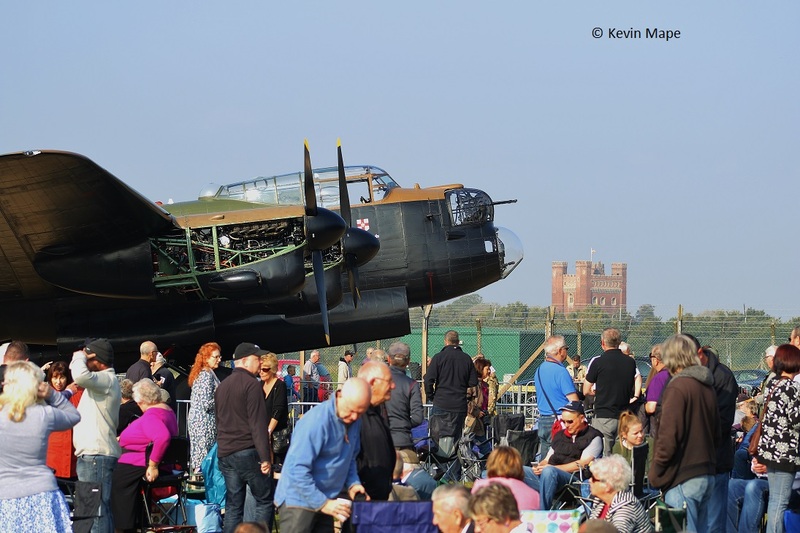 4th October 2015 the Lancaster was on the Static for the LLA Day, The People’s Lancaster. 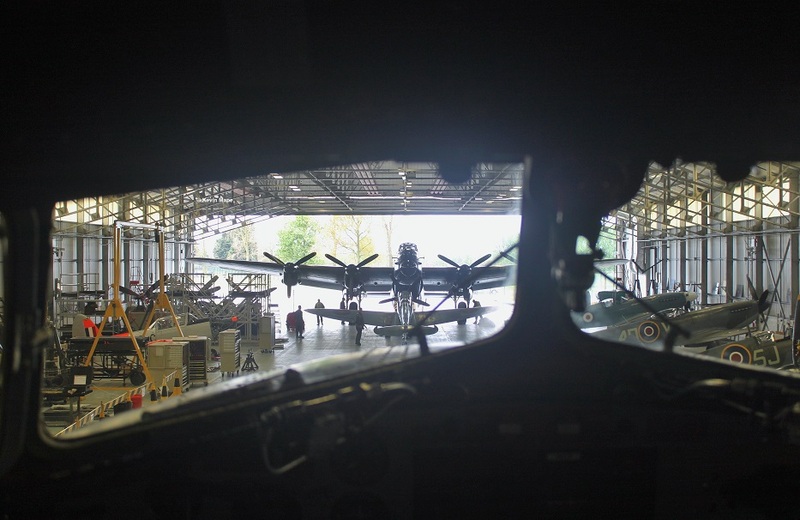 6th October 2015 – first engine runs. 14th October 1915 – f/f since the fire , PA474 did a flypast over the Bomber Command Memorial at Lincoln. This young lady looks lost in the Lancaster cockpit. PA474 first flight was on 3rd July 2017 to RAF Brize Norton for rollers, Coningsby had high cross winds. 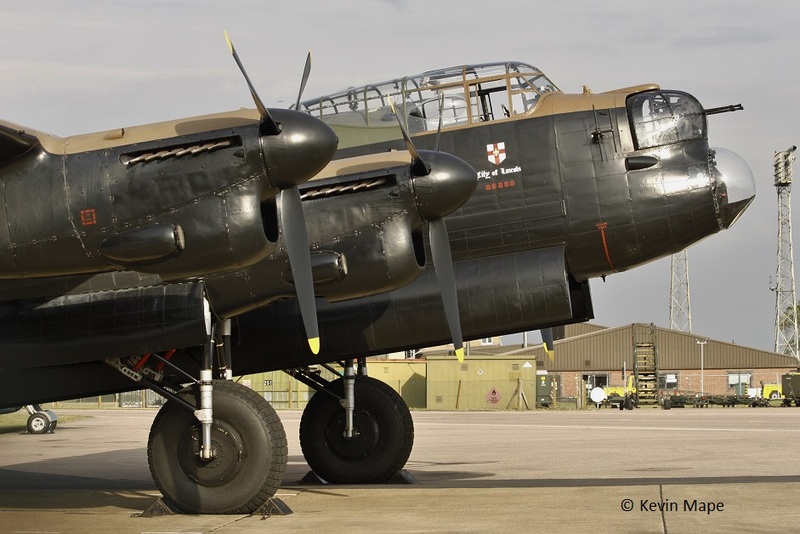 For the second time the Lancaster has been painted in two sets of marks. 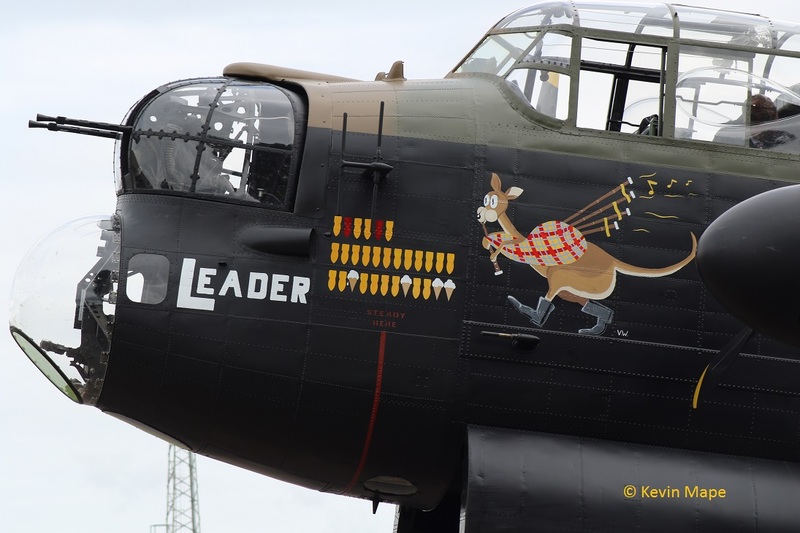 Starboard side – 50Sqn/VN-T The marks OC Andy millikin’s grandfarthers Lancaster in WW II 2017 – Current. Port side –460(RAAF)Sqn/AR-L “Leader” when based at RAF Binbrook. 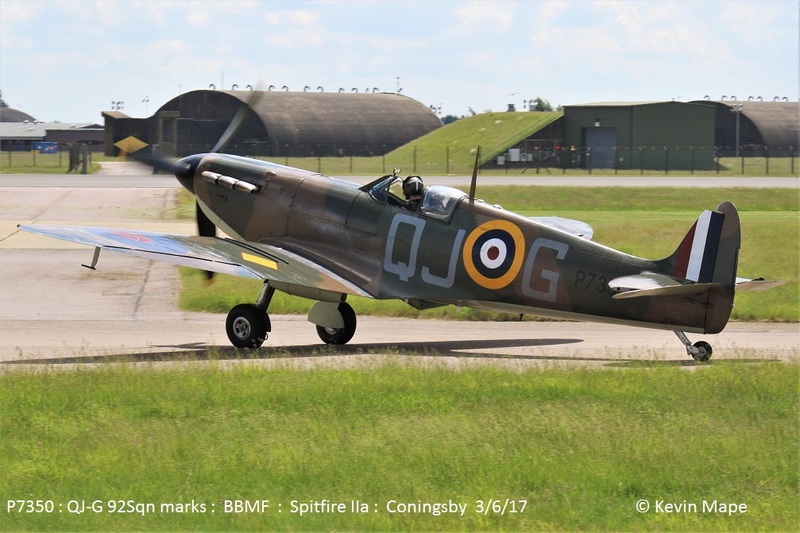 PA474 was delivered back to RAF Coningsby on 4th July 2017. Leader nose art taken at Coningsby on 16th July 2017. First flight of 2018 took place on 29th April 2018 having had a sixth poppy symbol added over the winter servicing. 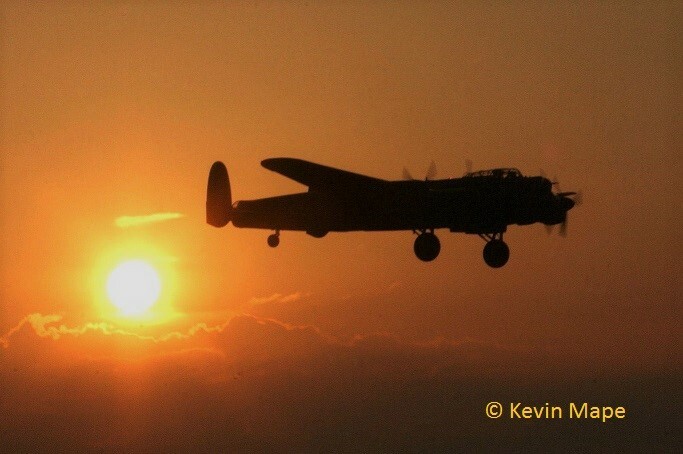 On a couple of occasions in 2018 the Lancaster has returned to Coningsby in the early evening as the sun began to set. 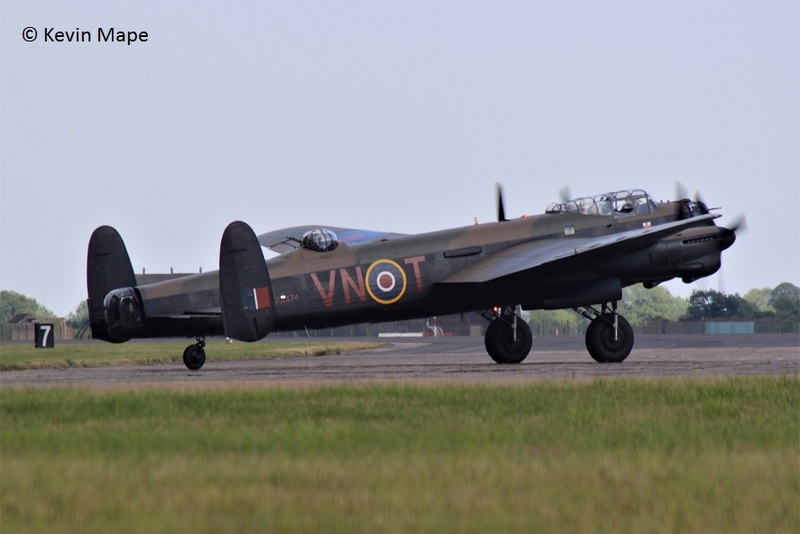 PA474 landing at Coningsby on May 4th 2018. Again on the 17th May 2018 after a visit to Labybower with the last remaining Dambuster Jonny Johnson as part of the crew. Built in March 1942 as C-47A – 60-DL 42-24338 at Long Beach California. 7/9/1943 – Delivered to the USAAF. This was short lived as it was transfired to RCAF under lend/lease. 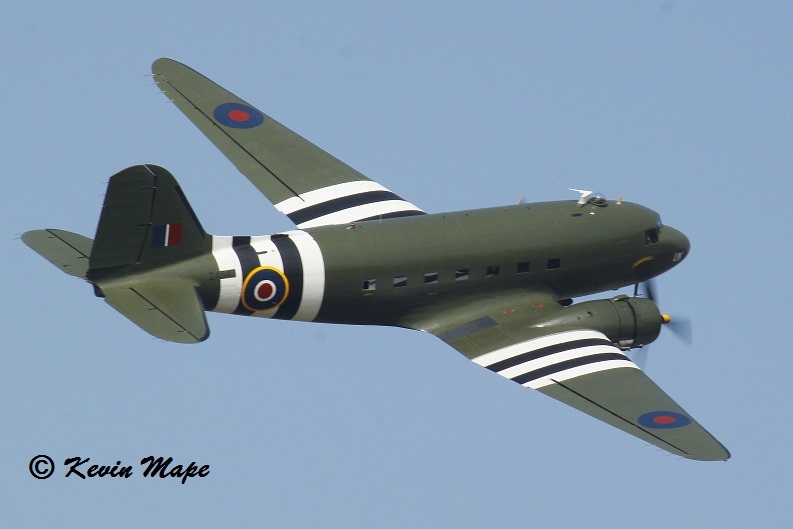 16/9/1943 – On charge with the RCAF with the serial 661 .It flew in a Drag green scheme as a Dakota Mk III /3FP. Allocated to 164(T)Sqn based at Monkton New Brunswick. 1943 – 1946. 1969 661 was put up for sale as surplus to RCAF requirements. April 1969 – 661 was purchased by Scottish Aviation on behalf of the RAE West Freugh. The Dakota was modified to drop small Sonar Bouys into the Sea off the coast of Port Patrick. The Dakota c3 was allocated serial KG661. 1979 – It flew as KG661 for 10 years until it was realised that KG661 was w/o in WW II so it was re-serialed as ZA947. 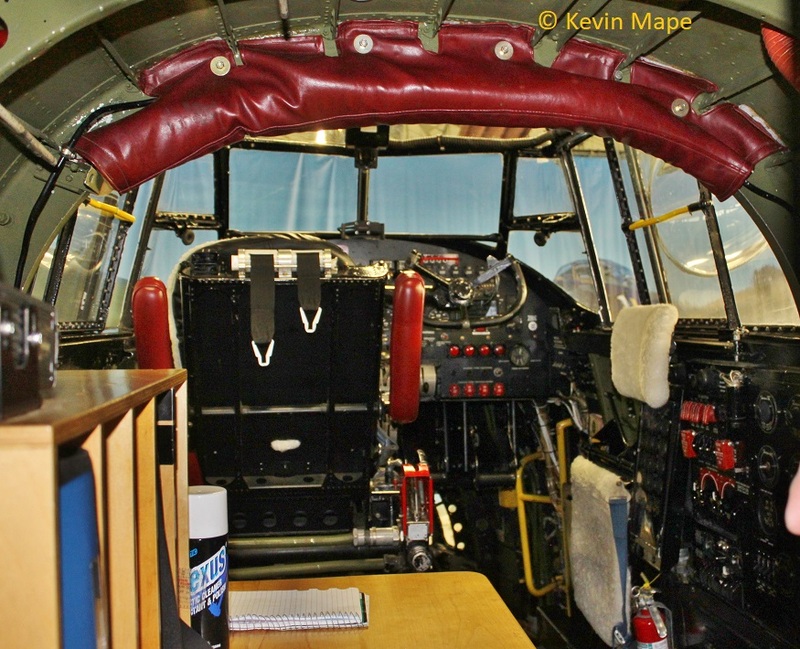 The Dakota had a airliner style interior with ex DH Comet seats and could fit upto 28 passengers. 1980 – ZA947 was based at RAE Farnborough. 1984 – ZA947 was repainted in a Raspberry ripple scheme. 1988 – ZA947 was again based at RAE West Freugh named “Port Patrick Princess”. 1990 – Damaged in a accident at RAE Farnborough when the undercarriage was retracted by mistake while on the ground, The right wing was replaced by Air Atlantique then flown to Coventry for servicing. 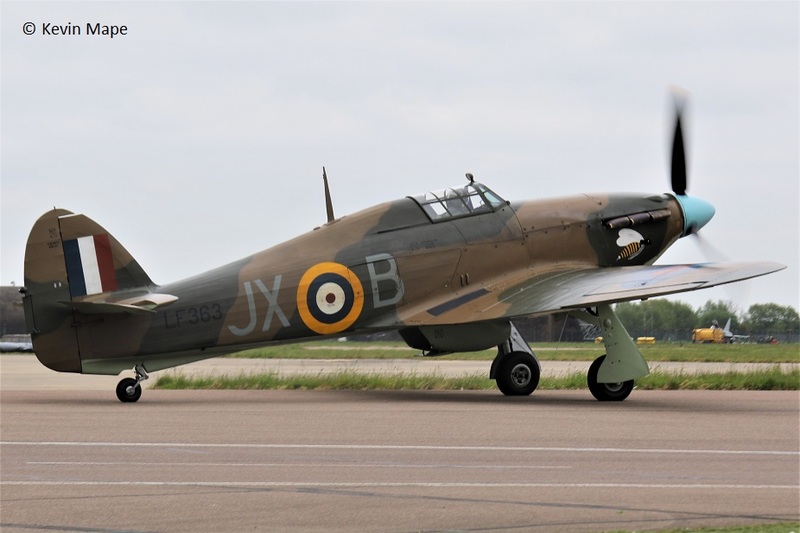 April 1993 – Transferred to the Battle of Britain Memorial Flight. July 1996 – Repainted by Air Atlantique at Coventry Airport. 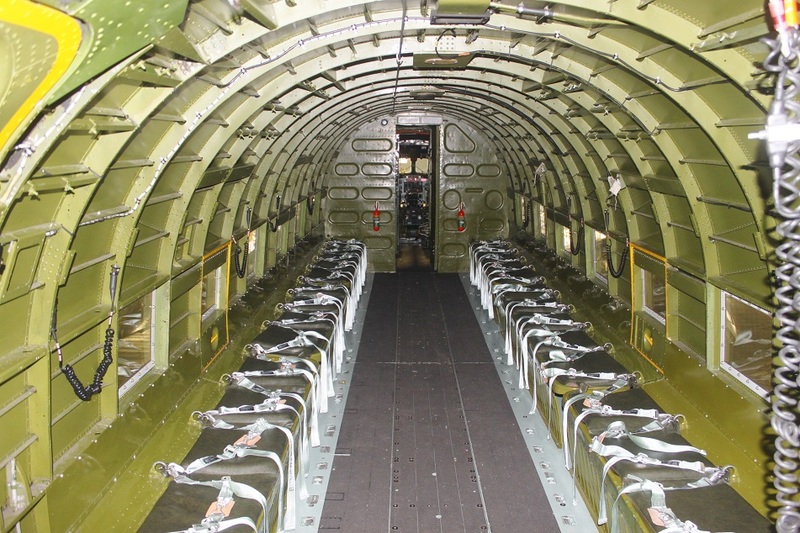 The Dakota has been restored back to a standard Para dropping configuration , This included a new floor fitted. 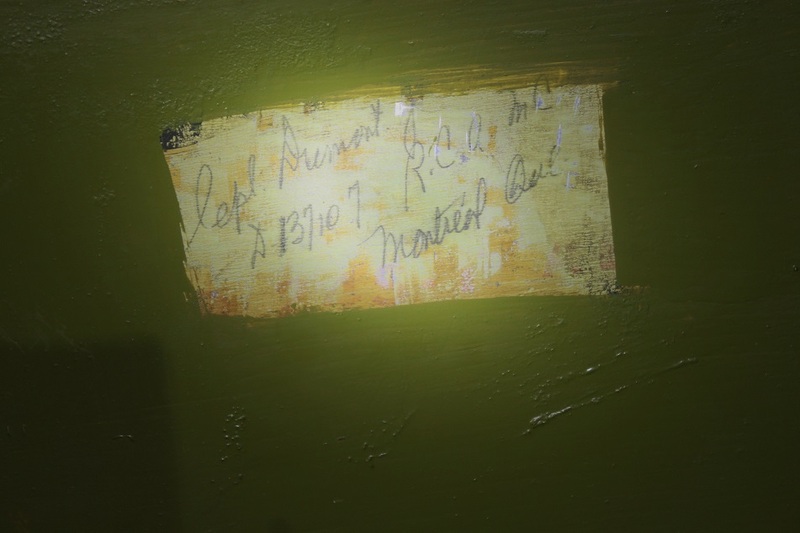 The names of people that had worked on the Dakota were found on the fuselage when in RCAF service in WW II have been preserved as well. 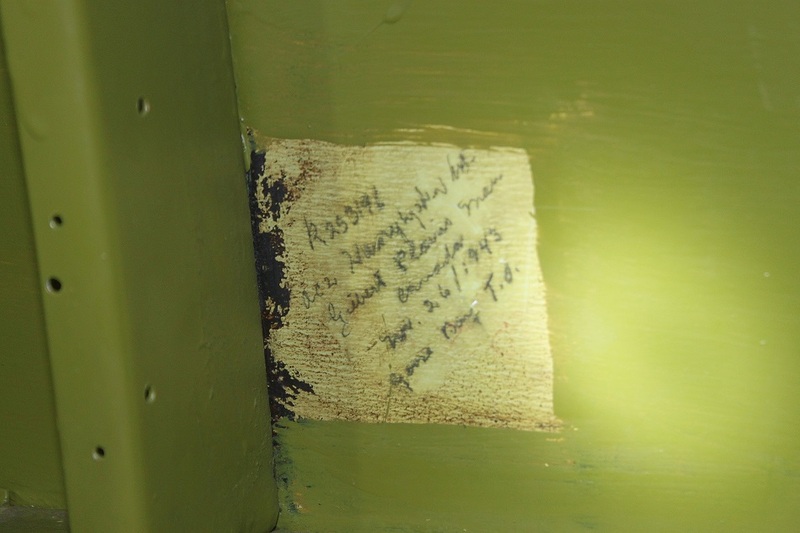 The names preserved on the inside of the Fuselage. The Dakota is also used as a trainer for the Lancaster crew. First flight of 2019 was January 28th . Royal Air Force Collage : Based at RAF Cranwell. Initail Training School : Based at RAF South Cerney then RAF Church Fenton. No.1 Flight Training School : Based at RAF Linton-on-Ouse. Noted on the static at RAF Cottesmore 15/9/73 in Red/white scheme coded E.
3 Air Experience Flight : Based at Filton Red/white scheme. 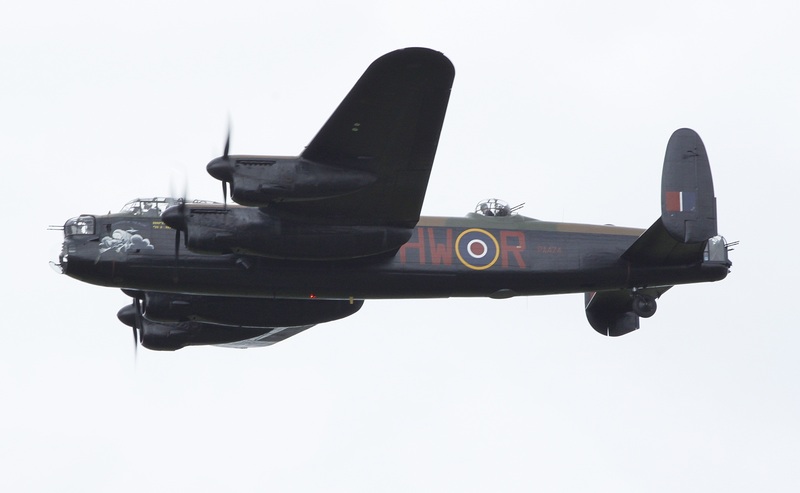 BBMF Based at RAF Coningsby 1995 – Current. Marks allocated – BBMF/G Black scheme/White bands. Repainted at Duxford in Bristol UAS marks coded E , delivered to Coningsby 6/3/18. WG486 parked with big brother – Coningsby 13/4/18. Allocated marks BBMF/K Based RAF Coningsby Black marks/White band. 2001 – 2011. 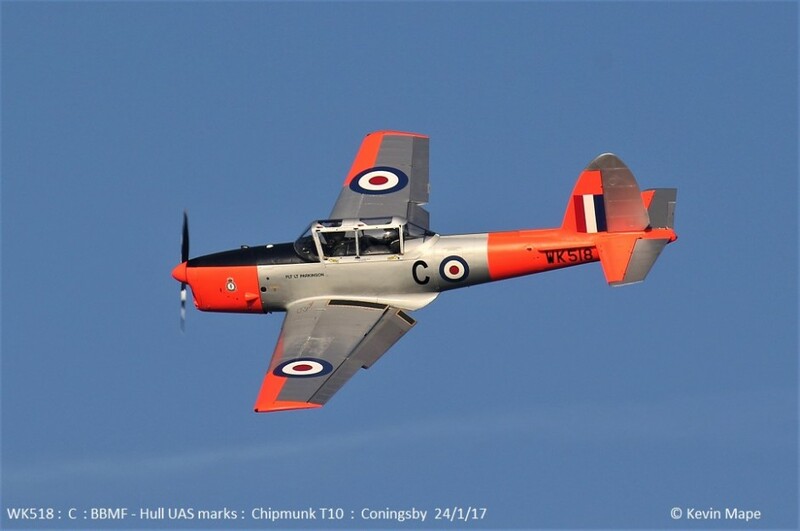 Allocated marks Hull UAS/C FLT LT PARKINGSON Silver/Dayglo/ marks 2013 – 2017. 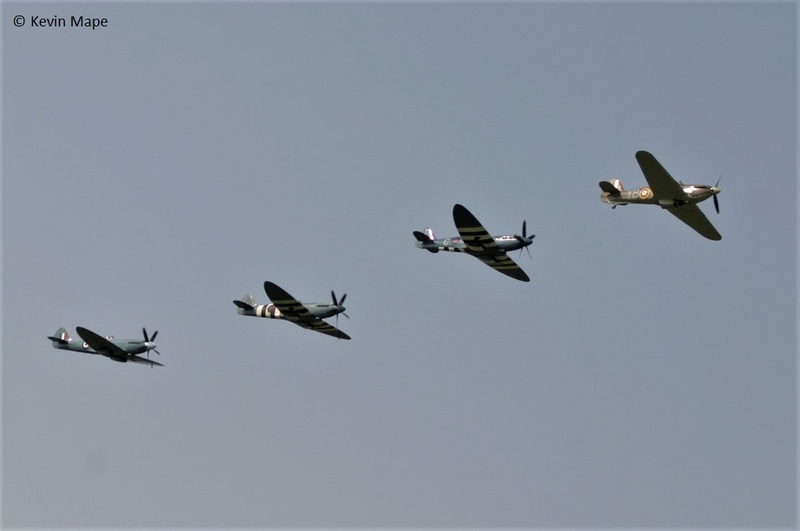 To celebrate the 100th year since the RAF was formed the BBMF will perform the Trenchard formation of Dakota, Lancaster, Spitfire & Hurricane. 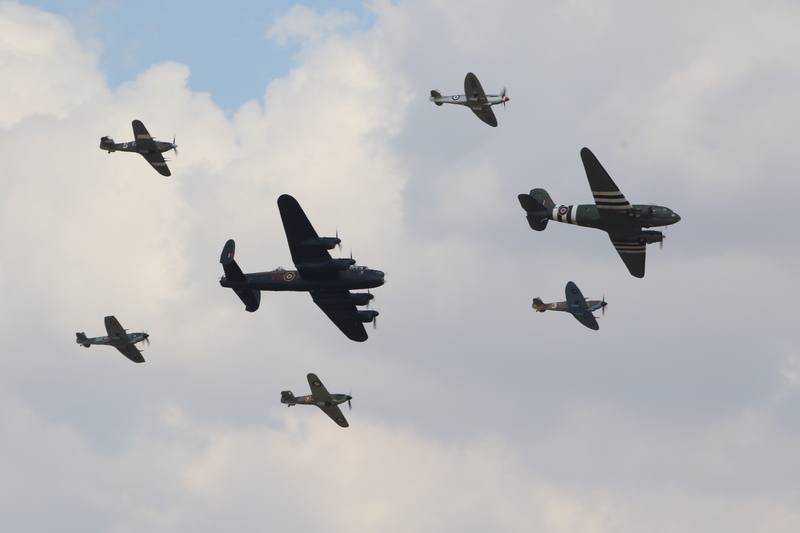 List of Aircraft that have been with the BBMF since 1957. BBMF – 1957 – to date. Aircraft used by the flight. 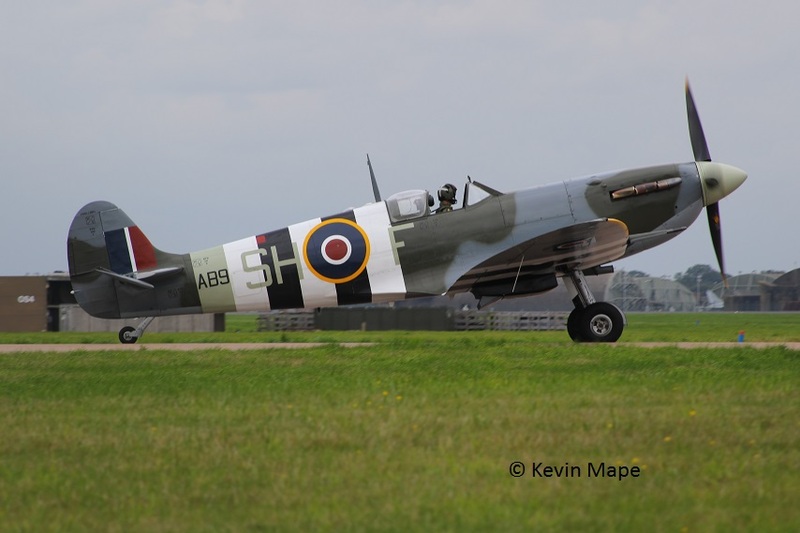 P7350 – Spitfire IIa – current. AB910 – Spifire Vc – current. 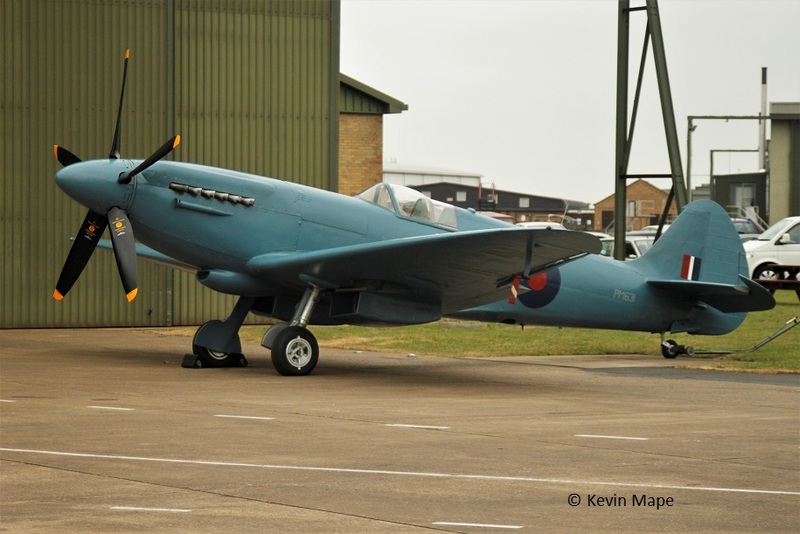 MK356 – Spitfire LF IXe – Current. 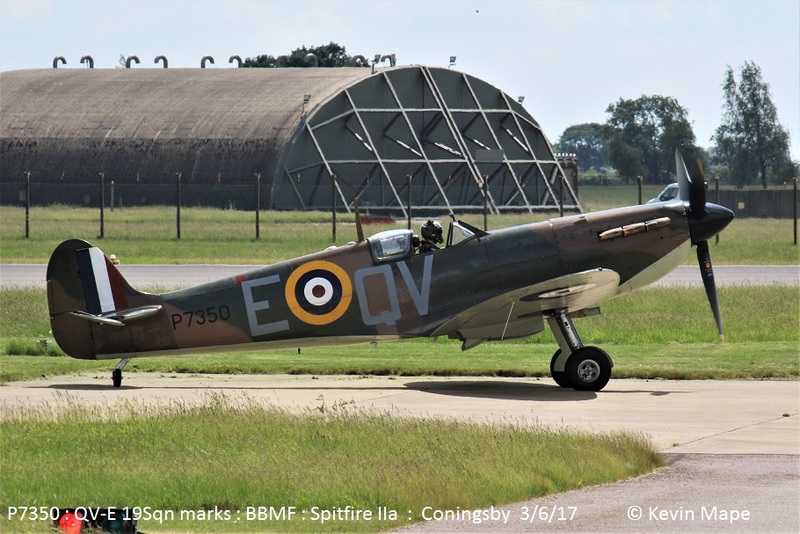 PM631 – Spitfire PR.XIX – current. 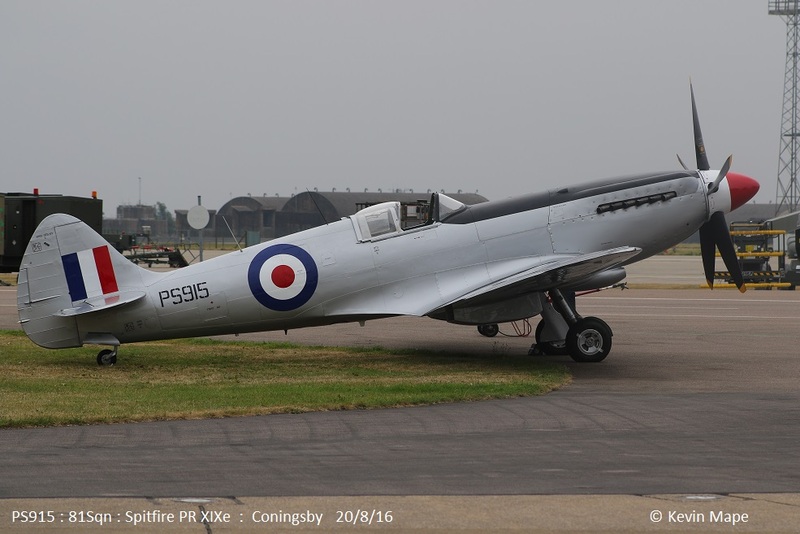 PS853 – Spitfire PR.XIX – Sold. 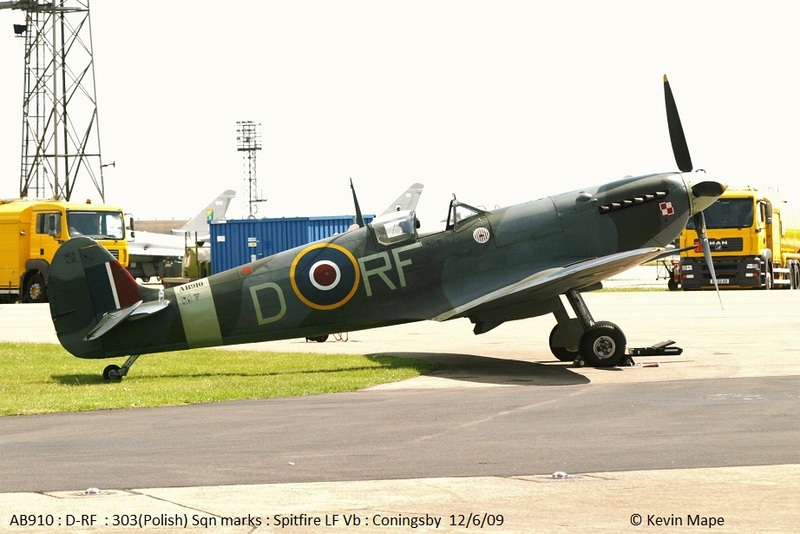 PS915 – Spitfire PR.XIX – current. 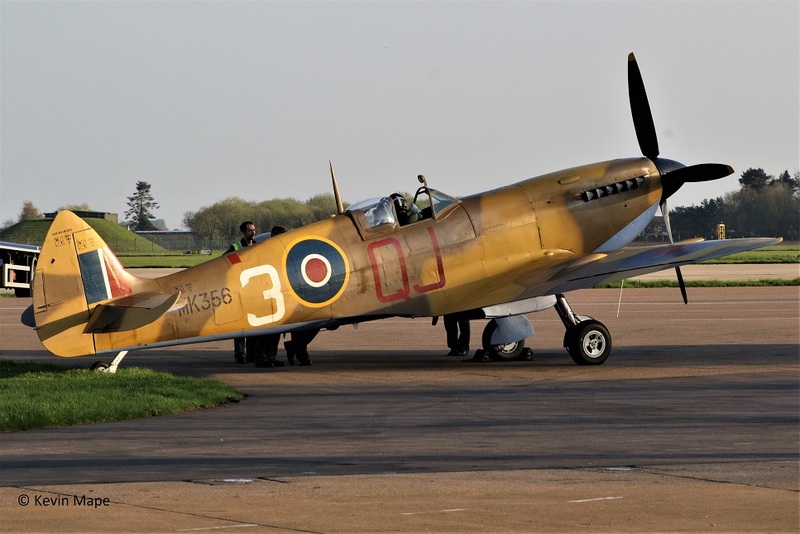 SL674 – Spitfire XVI – WFU. 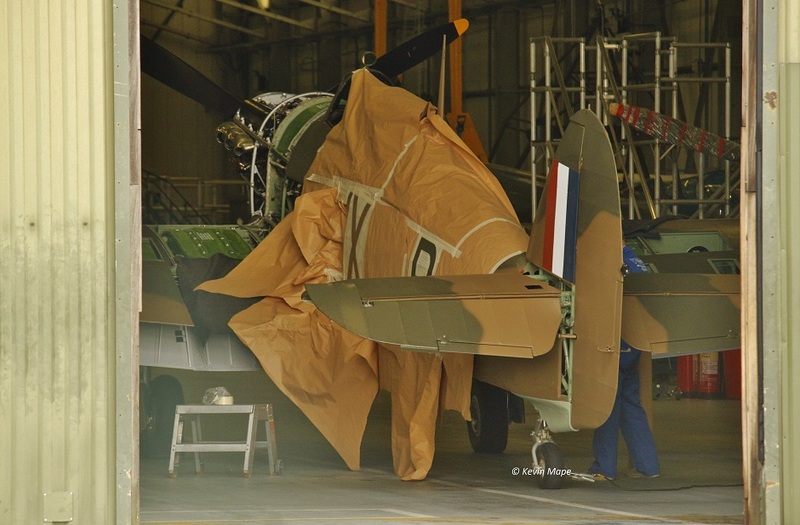 TB382 – Spitfire XVI – Fuselage to the I.O.W swapped for a new wing for TE311. 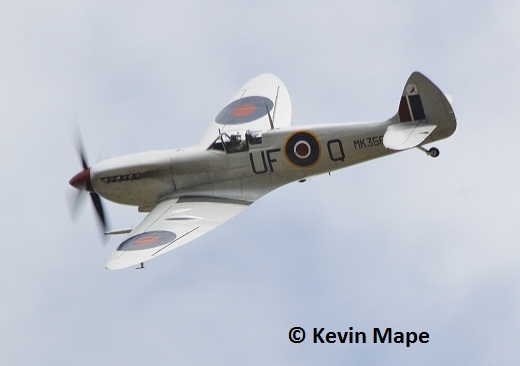 TE311 – Spitfire XVI – current. 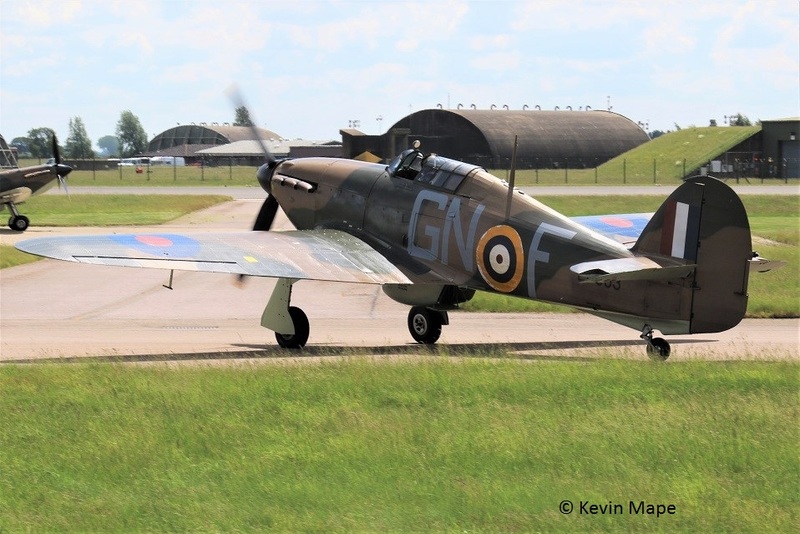 TE330 – Spitfire XVI – WFU. 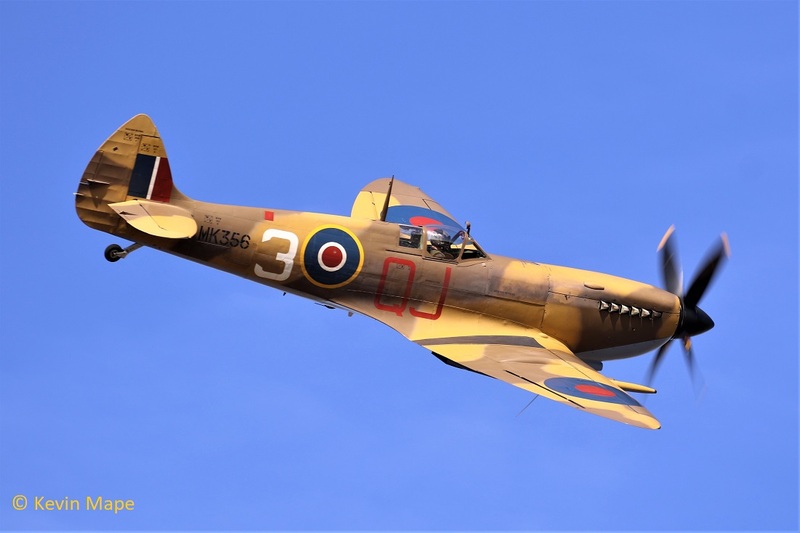 TE476 – Spitfire XVI – WFU. 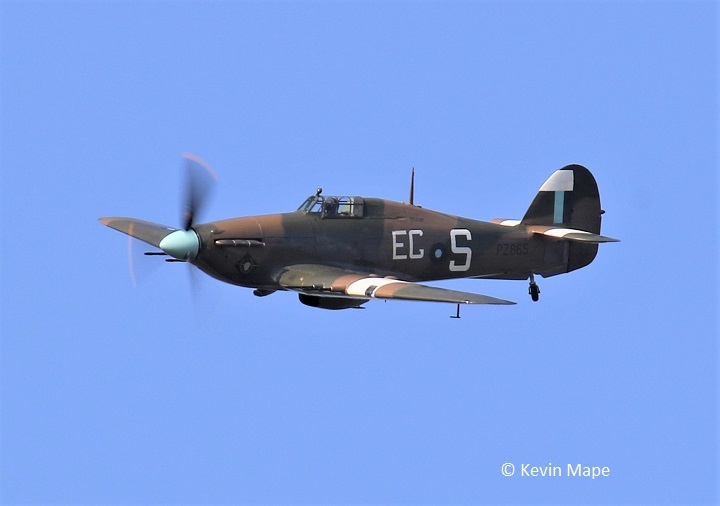 LF363 – Hurricane IIc – current. 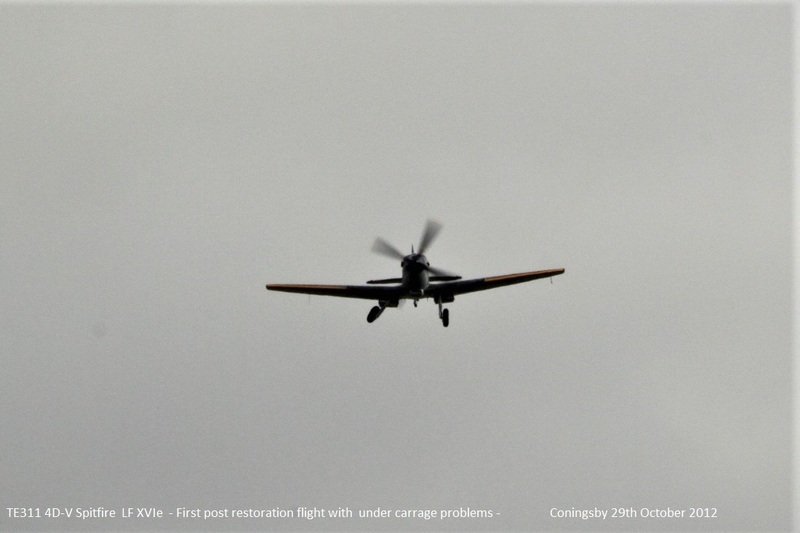 PZ865 – Hurricane IIc – current. PA474 – Lancaster B1 – current. ZA947 – Dakota III – current. 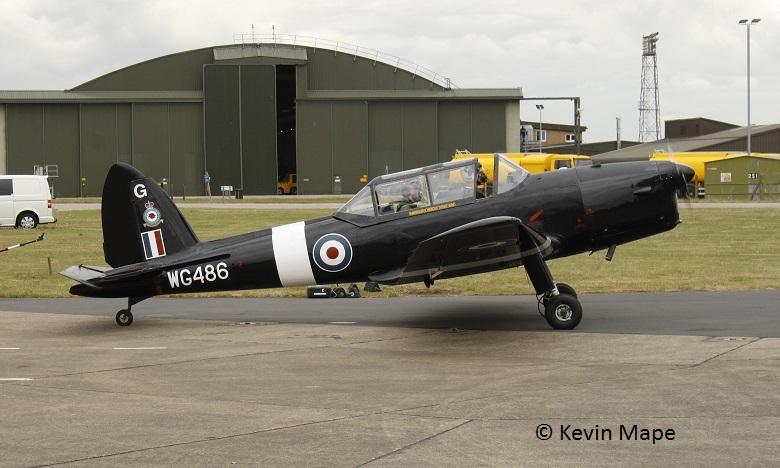 WG486 – Chipmunk T10 – current. WK518 – Chipmunk T10 – current. 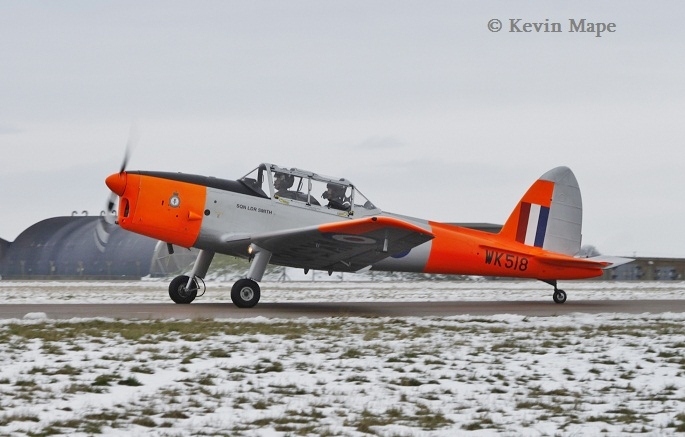 WP855 – Chipmunk T10 – To 1AEF 1987. VP981 – Devon C2 – Sold.